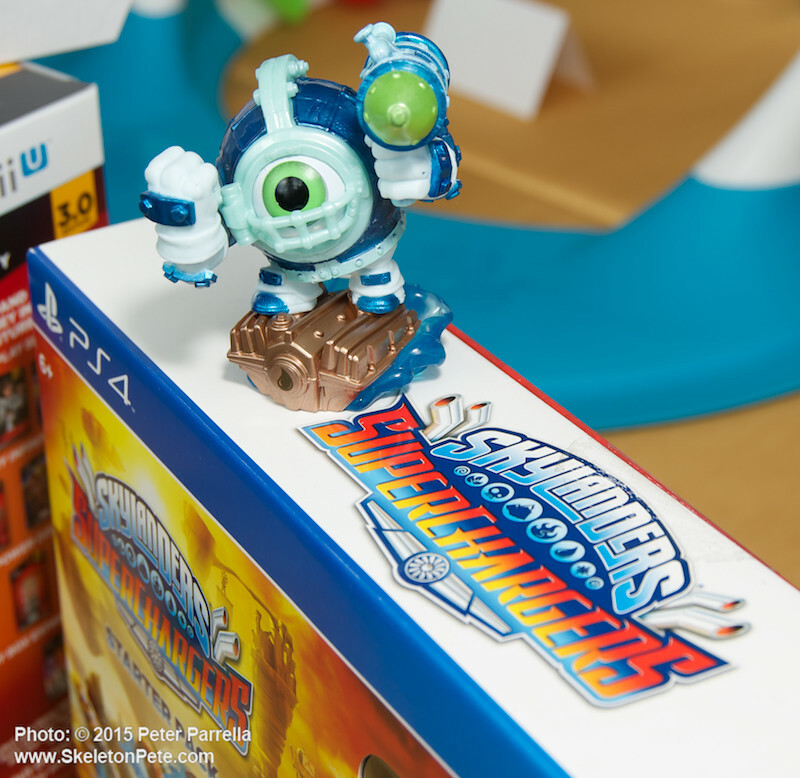 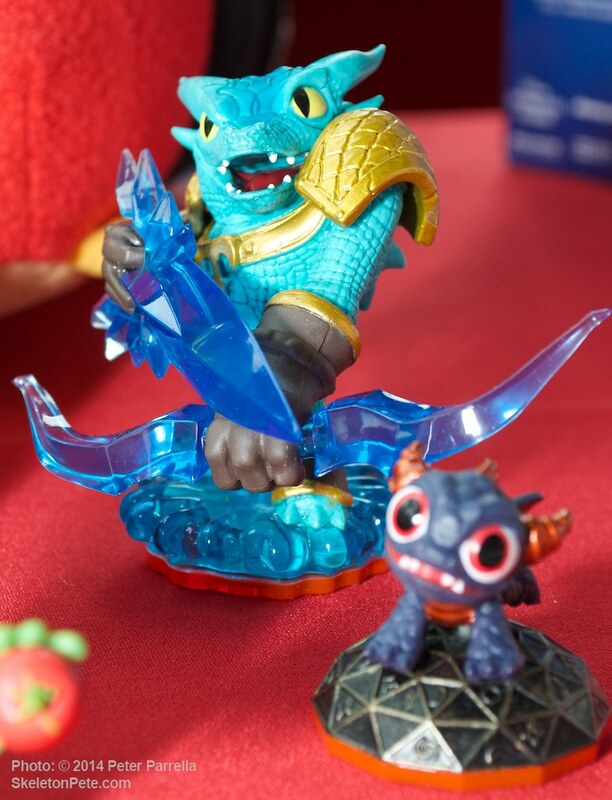 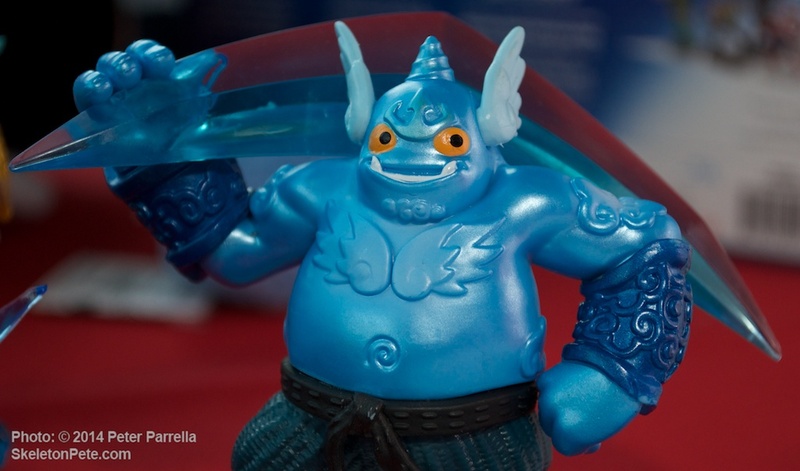 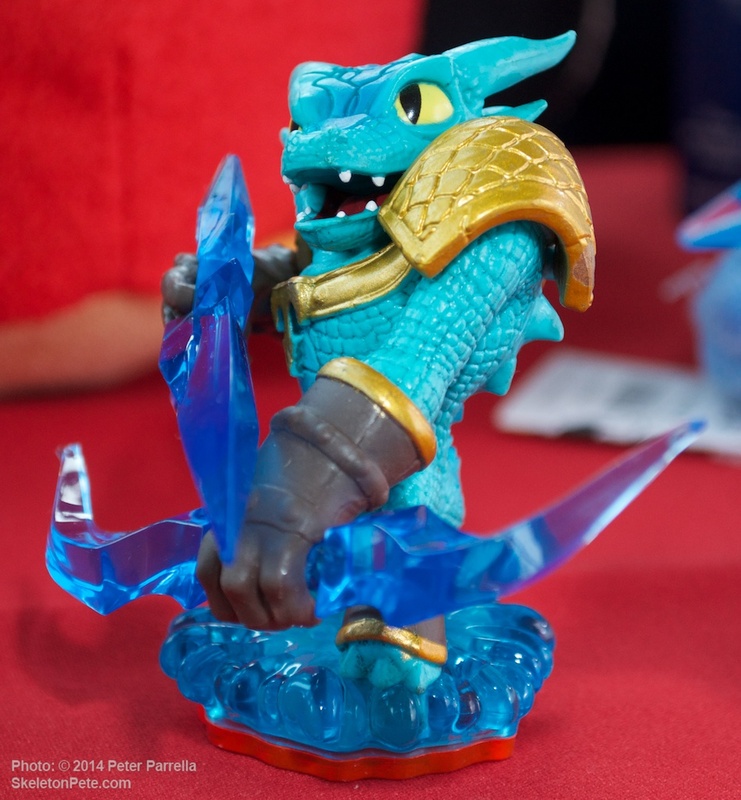 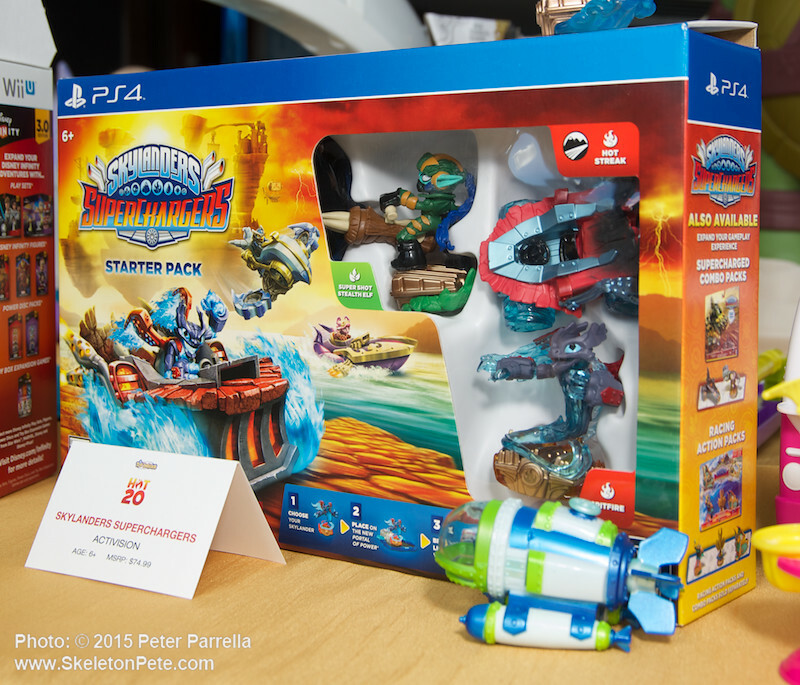 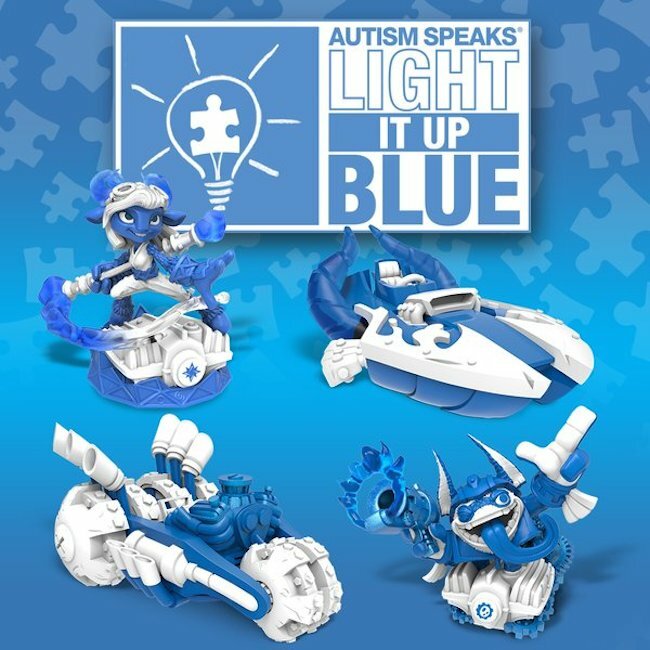 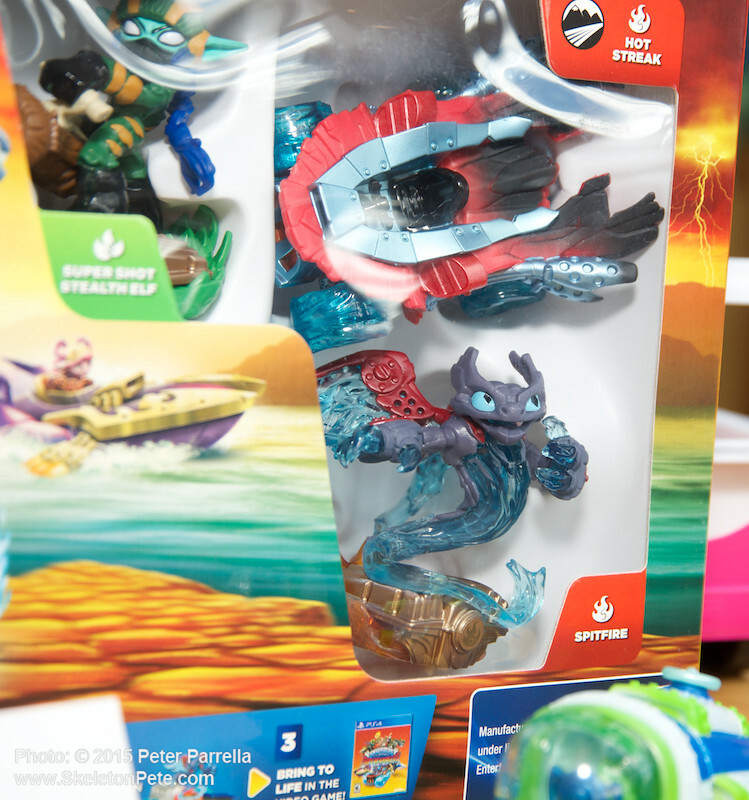 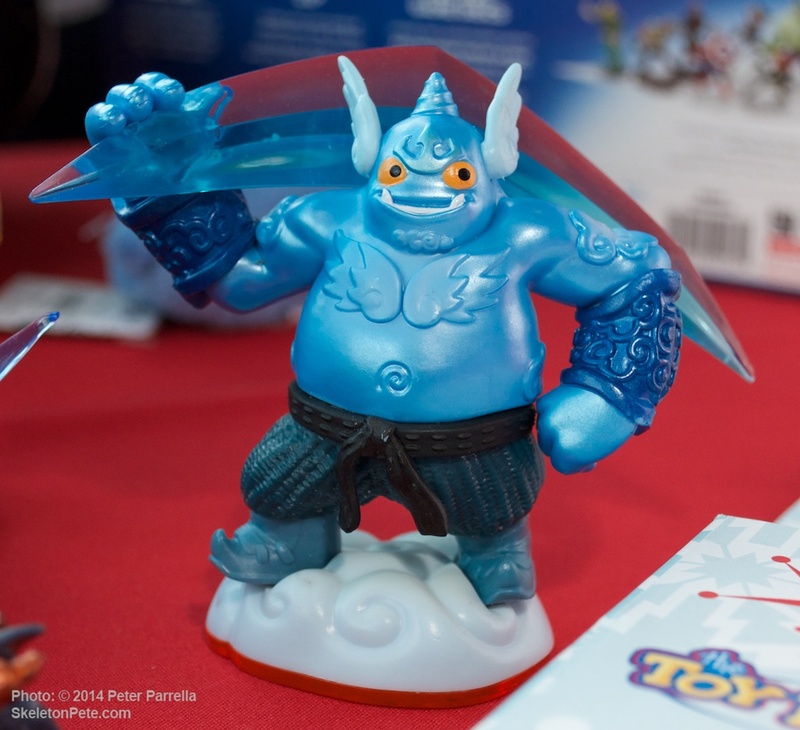 Special edition “Light It Up Blue” Skylanders figures released for Autism Awareness Month. 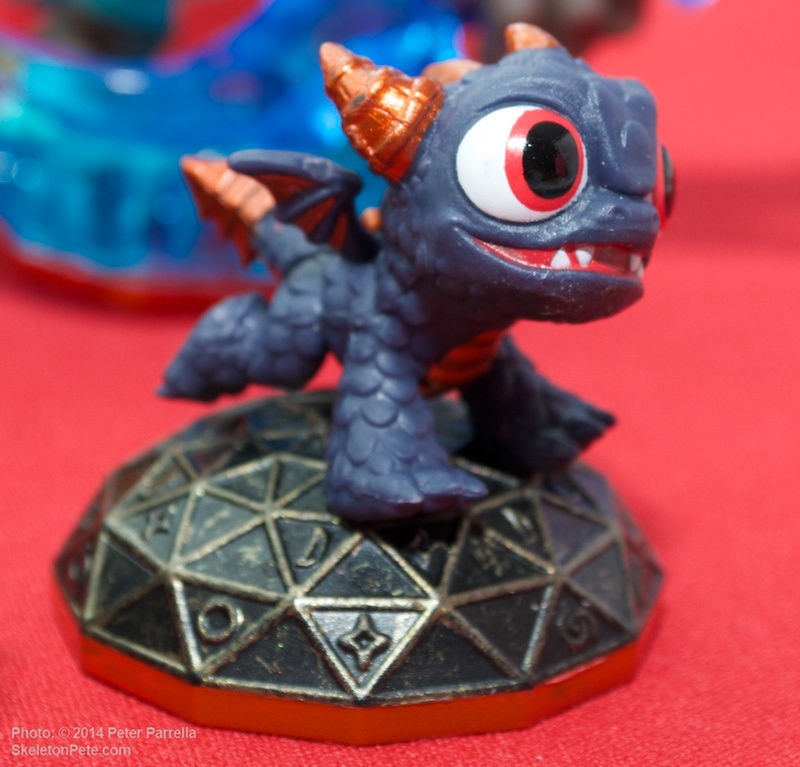 At SkeletonPete we’ve been fans of Activision’s Skylanders, since Ken Pierce (PiercingMetal.com) and I first experienced a pre-release demo of Spyro’s Adventure at the Toy Industry Association Toy Fair almost six years ago. 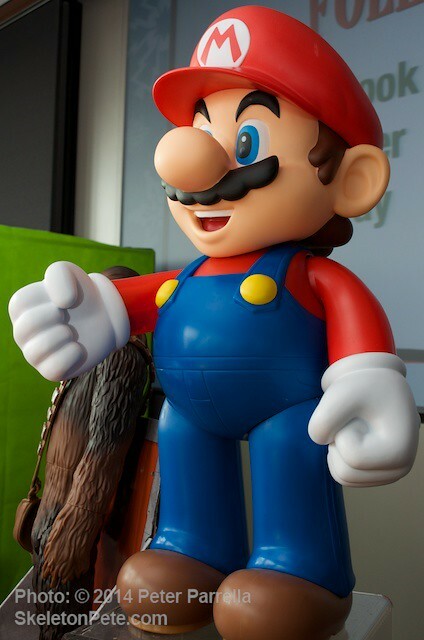 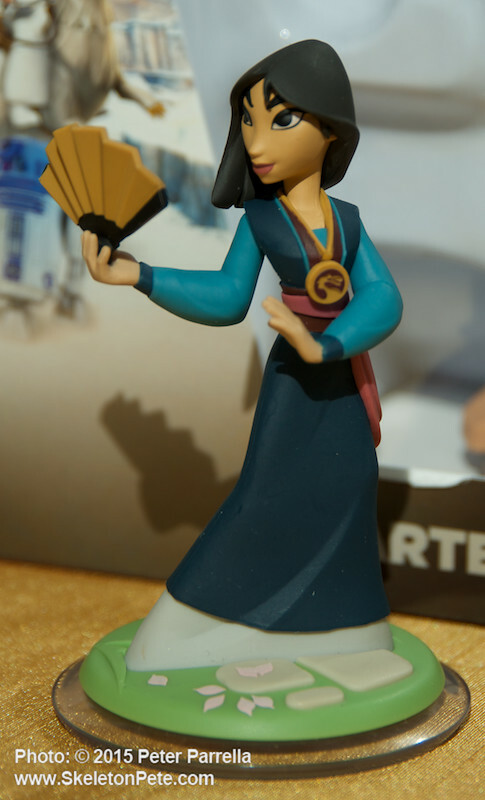 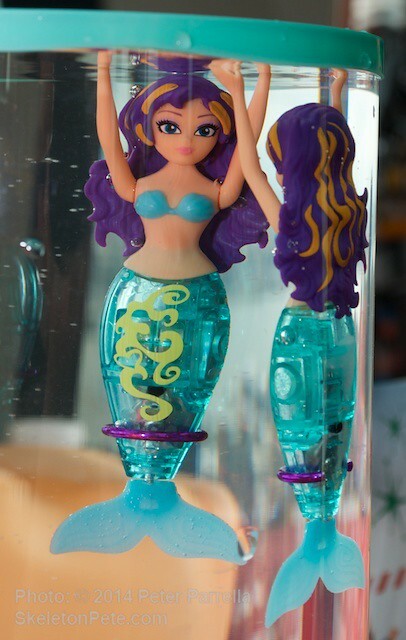 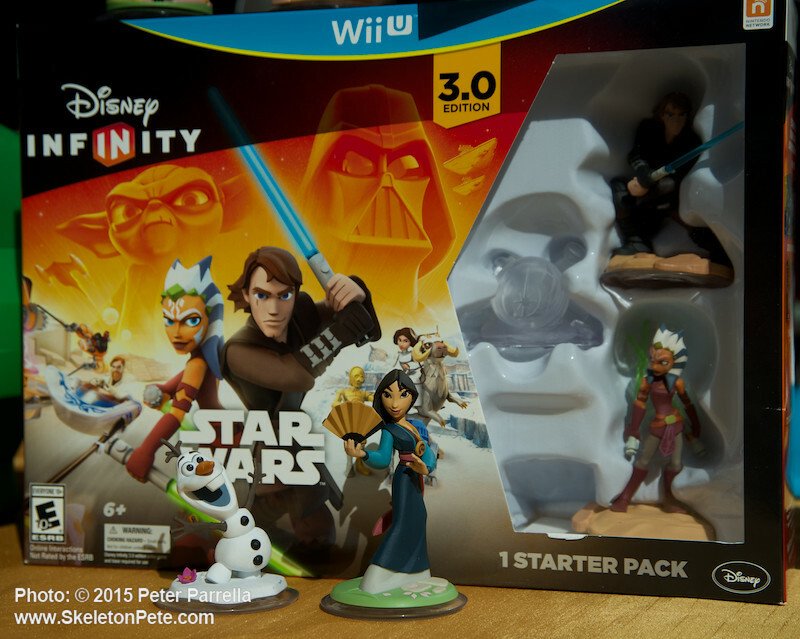 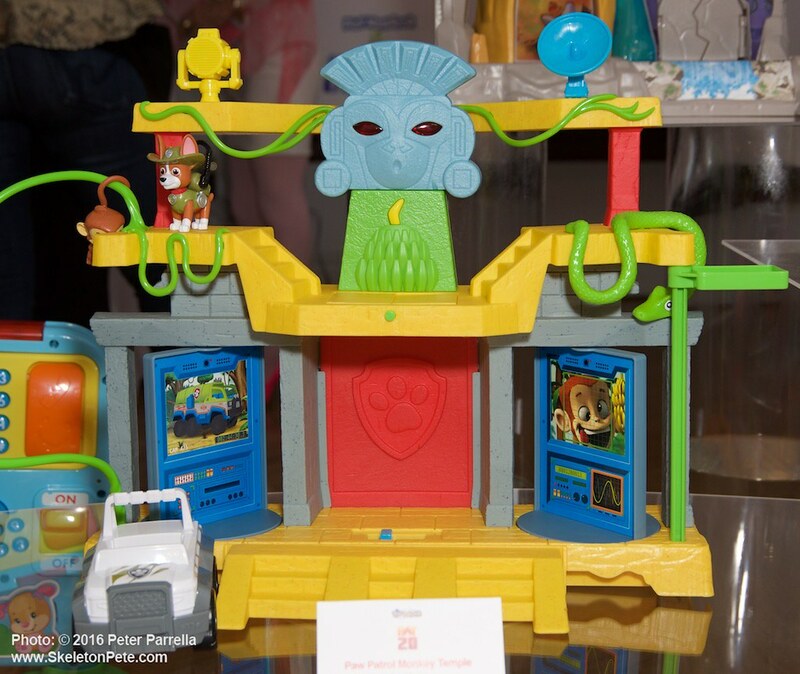 The combination of video game play with collector figures that “entered” the screen was a stroke of genius. 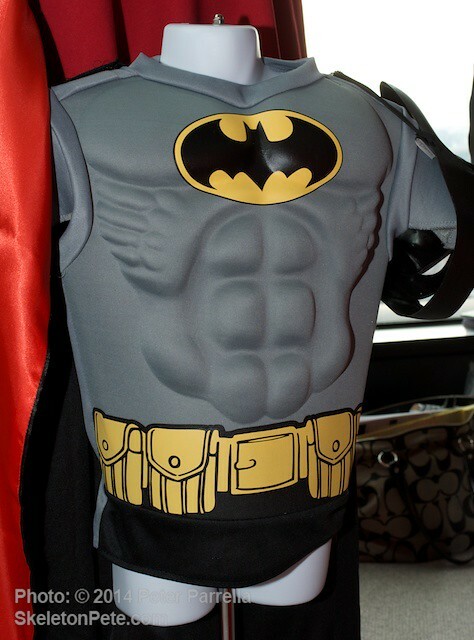 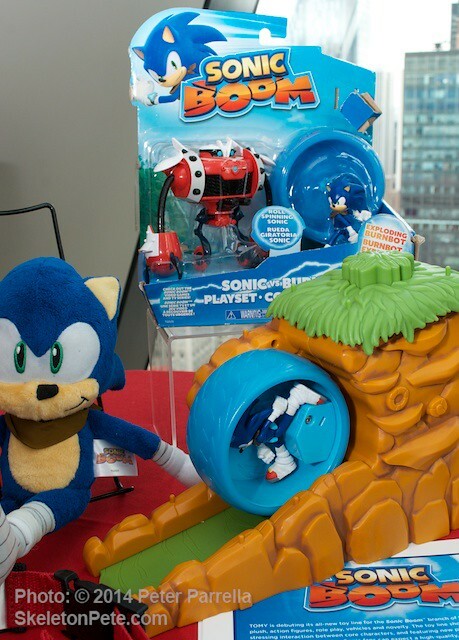 Since then the company has built success upon success, turning the product into a collossal licensing franchise. 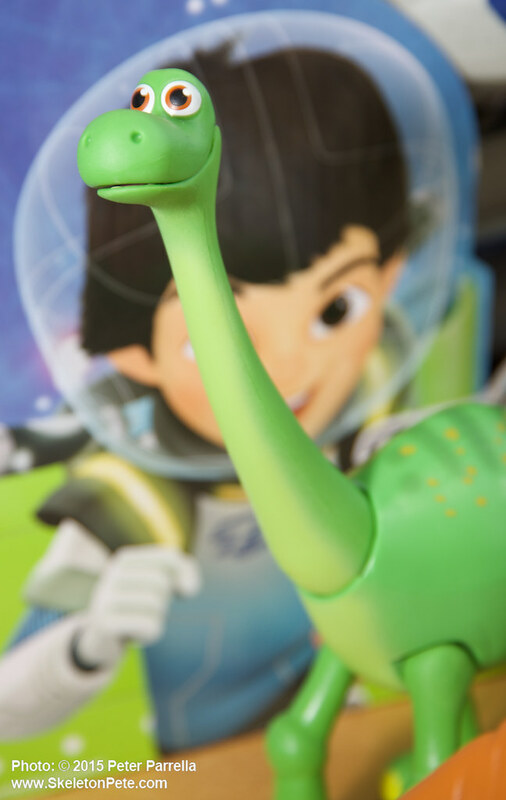 Along the way the characters have been giant-sized, captured in crystal traps, split into swappable pieces, presented as a Macy’s Thanksgiving Day Parade balloon, and more recently given supercharged vehicles to traverse land, sea and air. 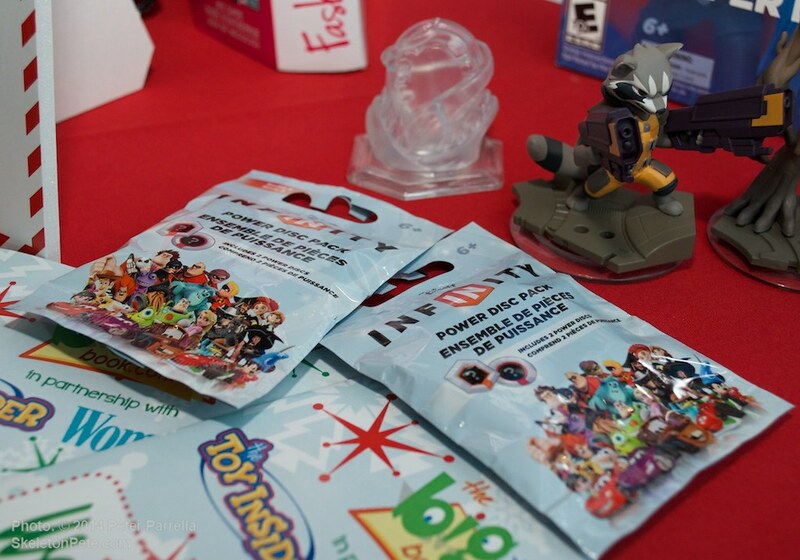 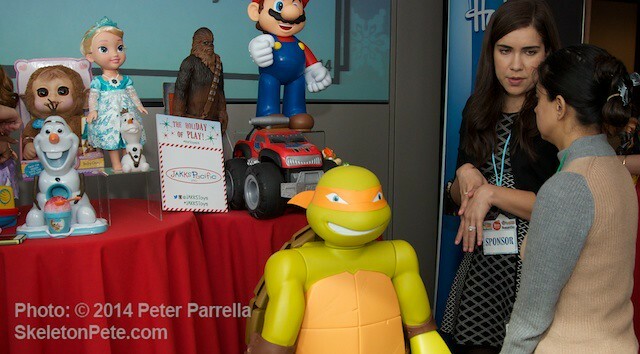 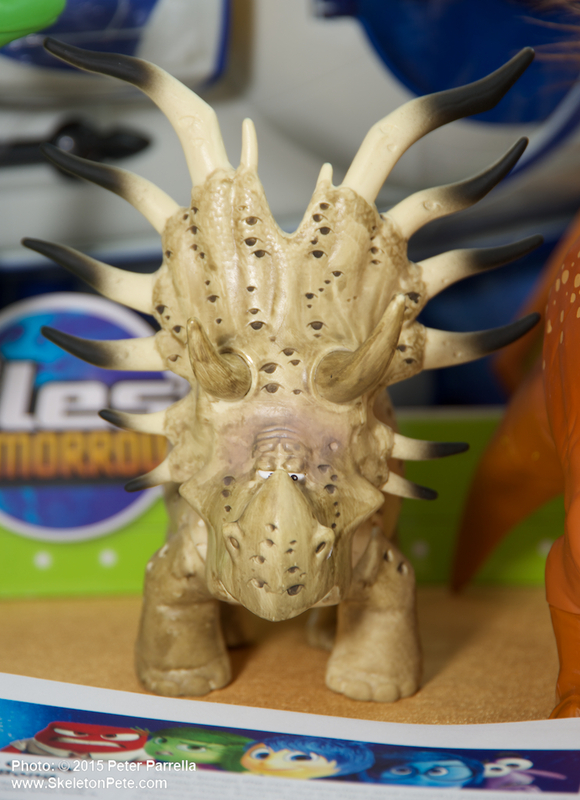 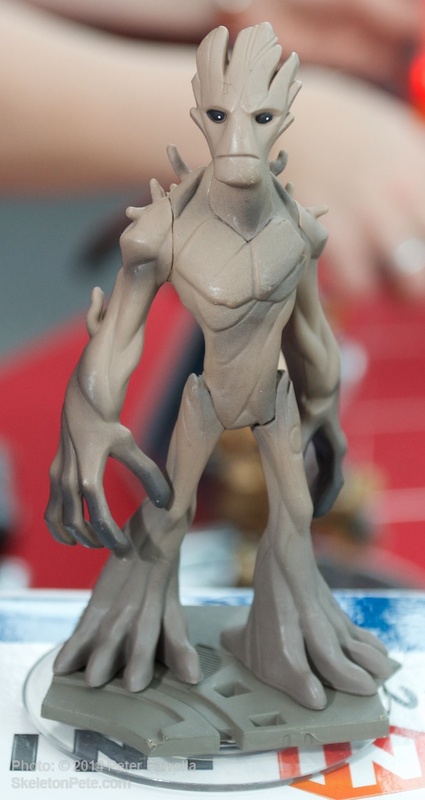 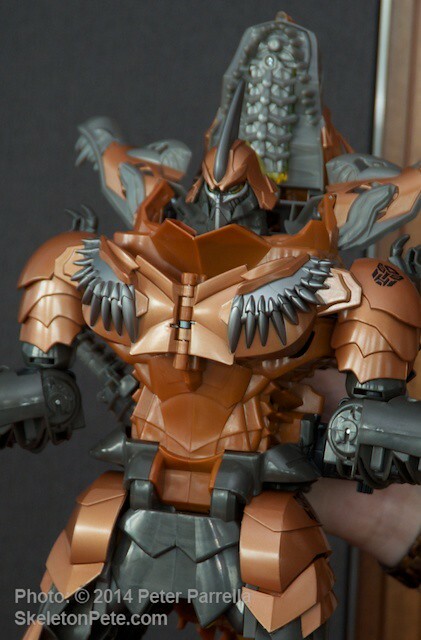 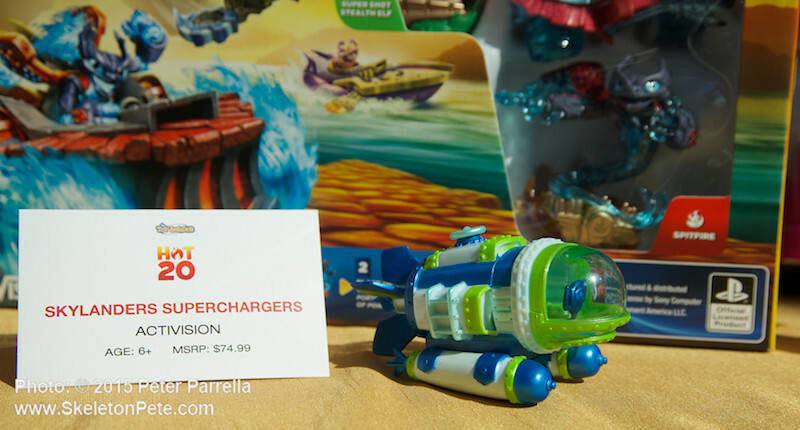 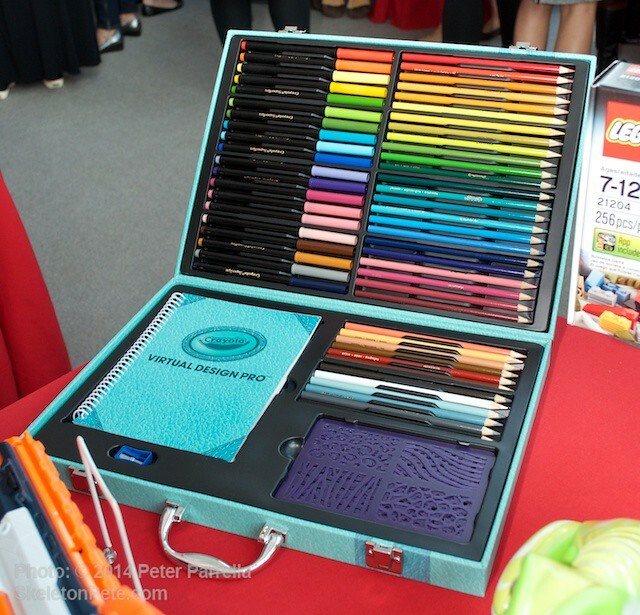 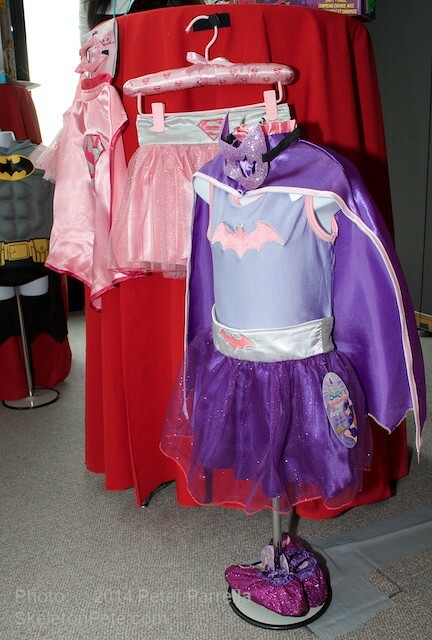 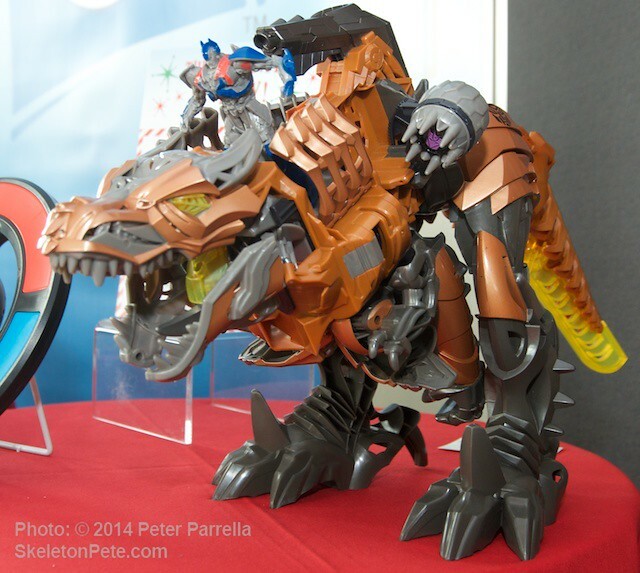 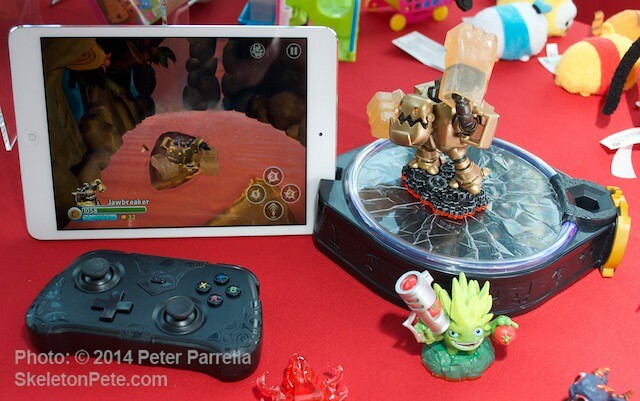 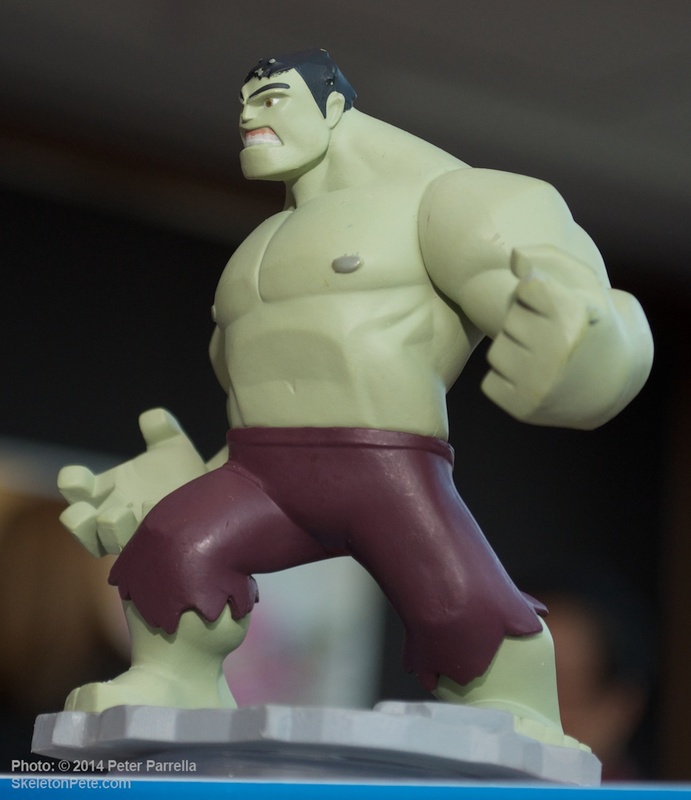 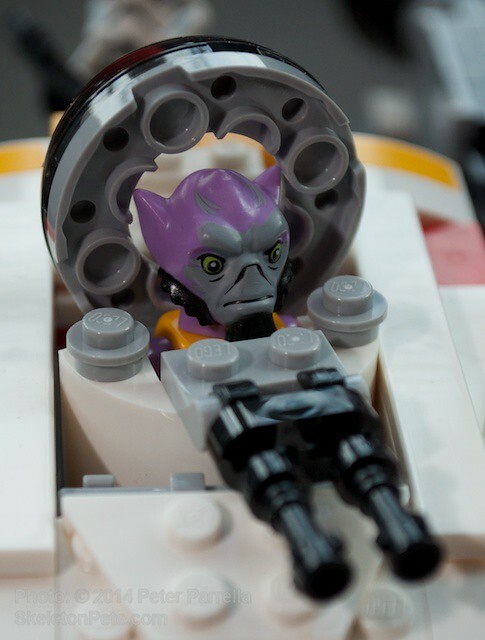 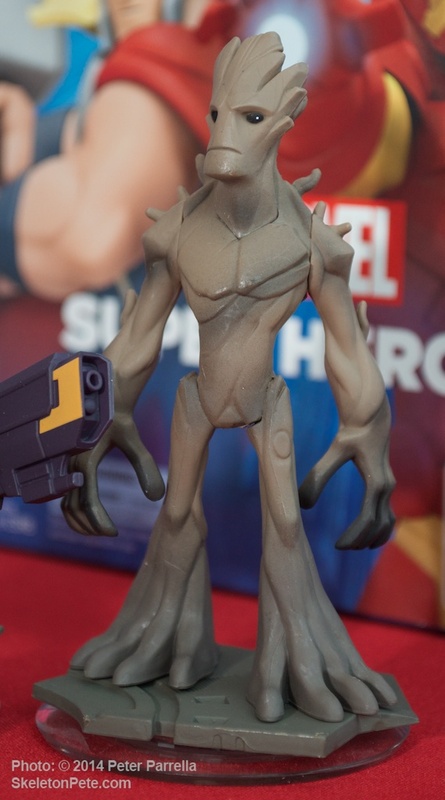 Our first encounter with the Superchargers was at last summer’s Toy Insider Sweet Suite press event. 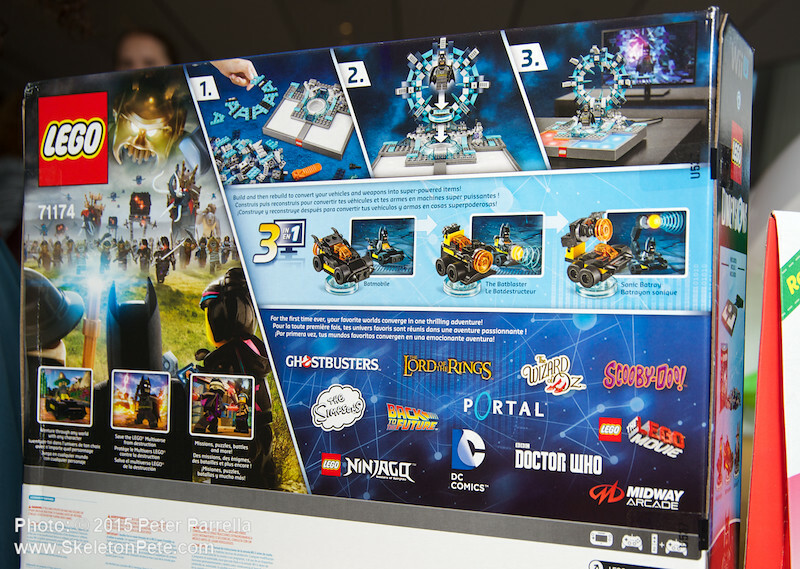 Check the images below. 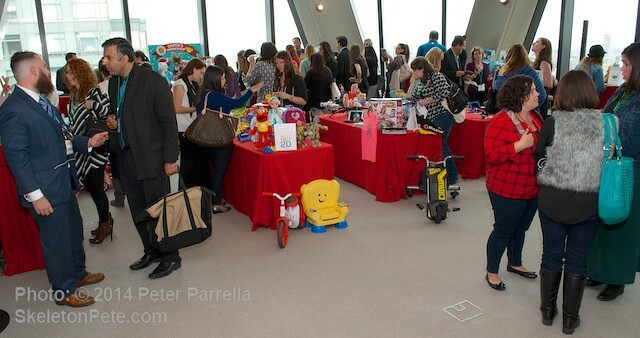 On a gorgeous late October afternoon co-editor Adriana “Andy” Melendez (@sylverwhisper) and I joined other members of the press and blogger community on the 44th floor of New York City’s Hearst Building for a grand event to kick off the coming gift giving season presented by the folks at The Big Toy Book.Com, in partnership with The Toy Insider and Woman’s Day Magazine. 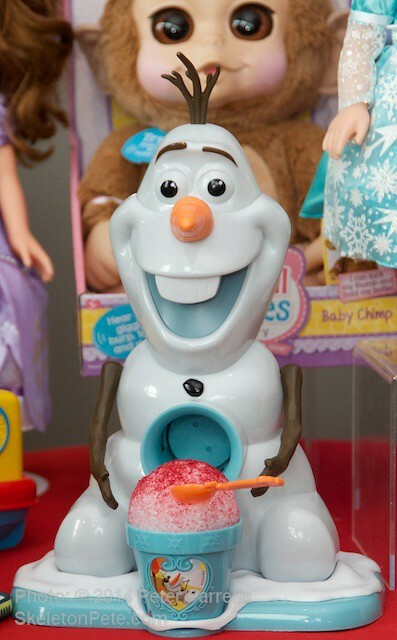 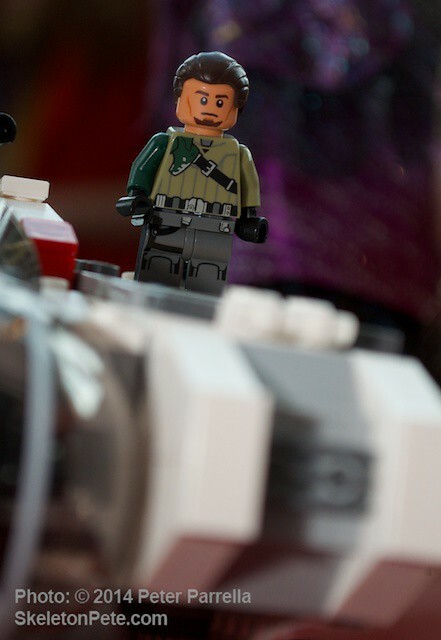 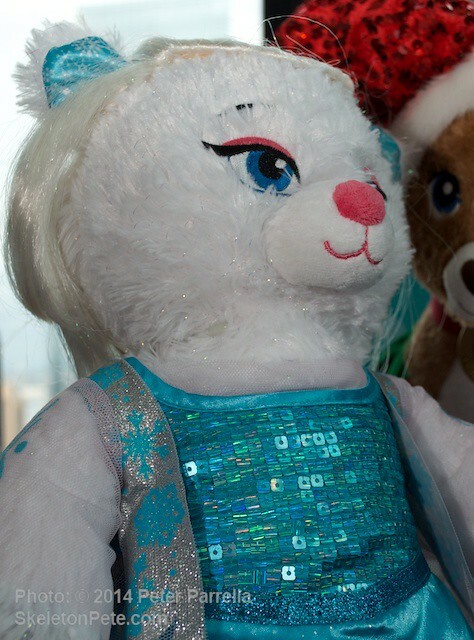 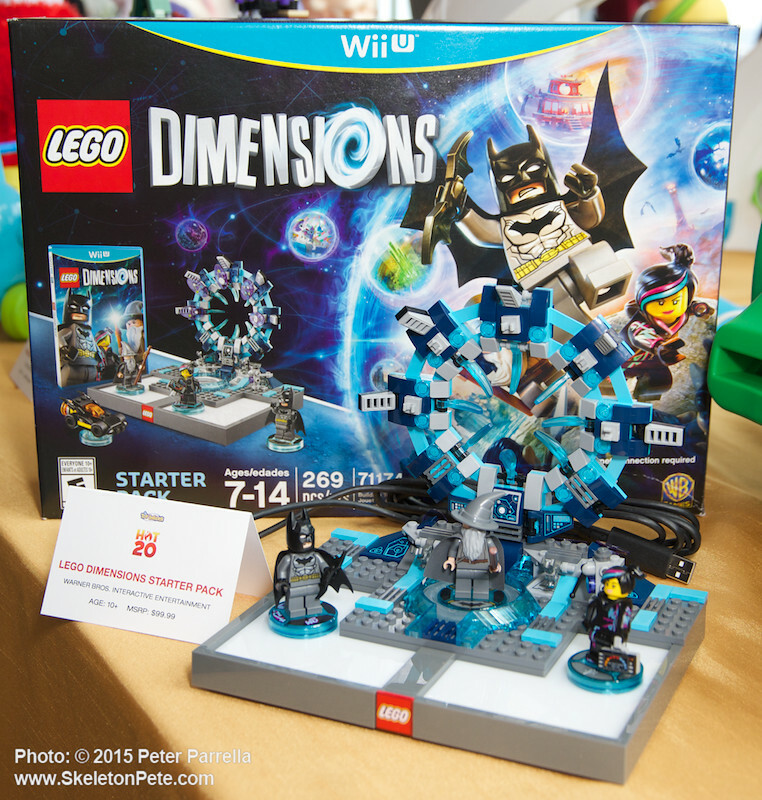 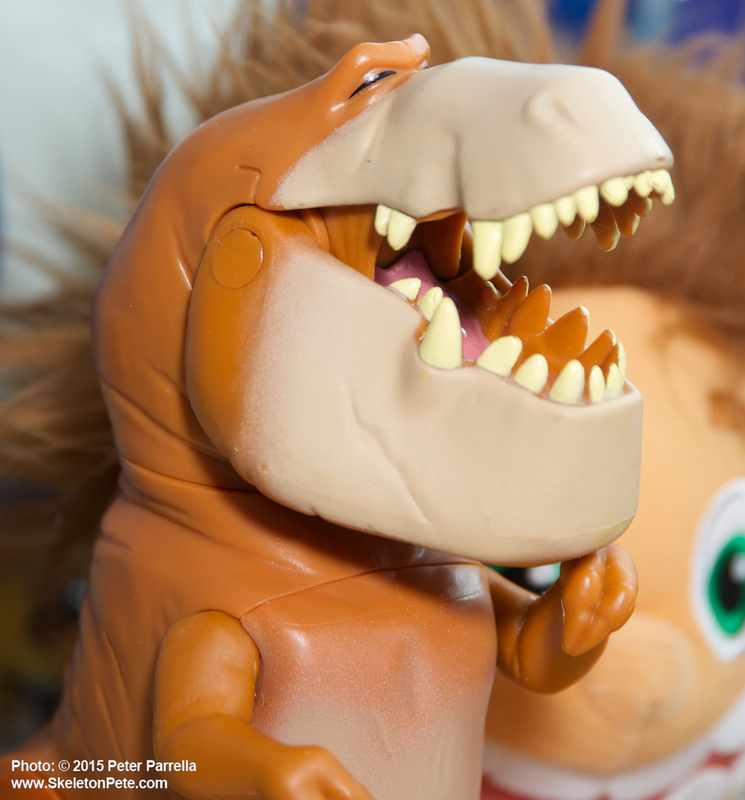 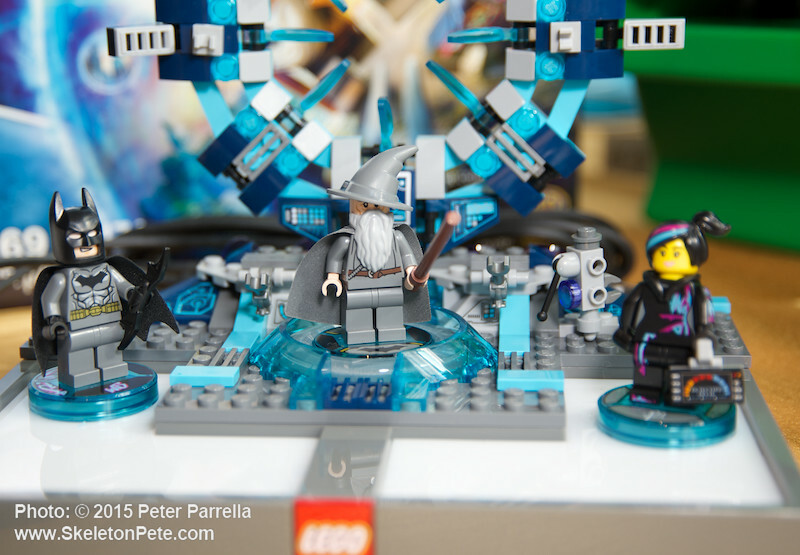 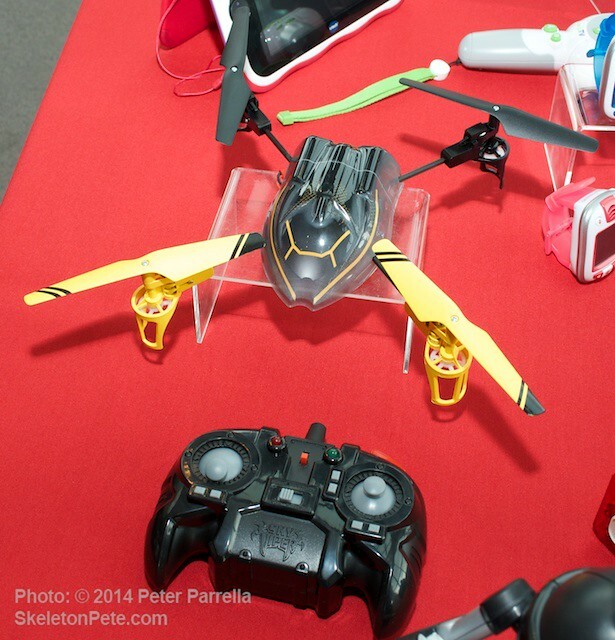 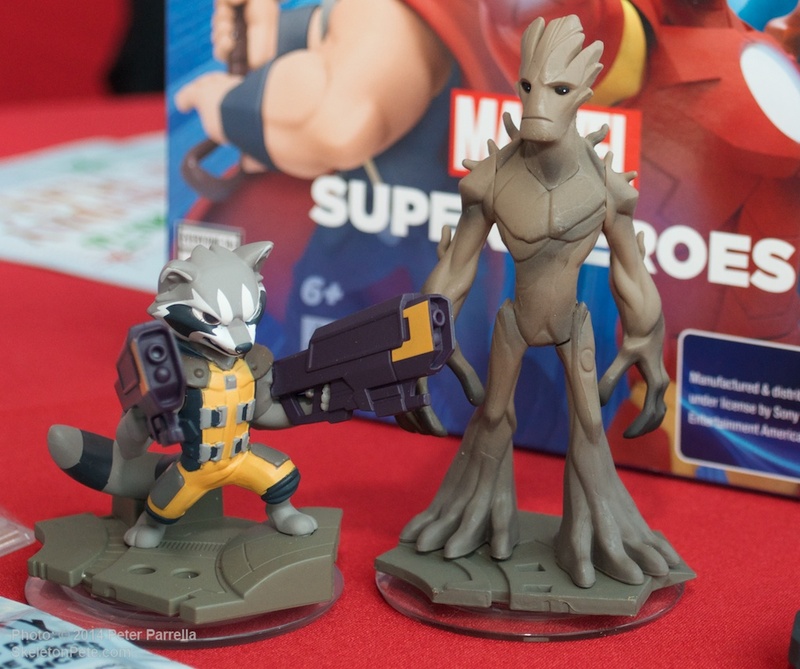 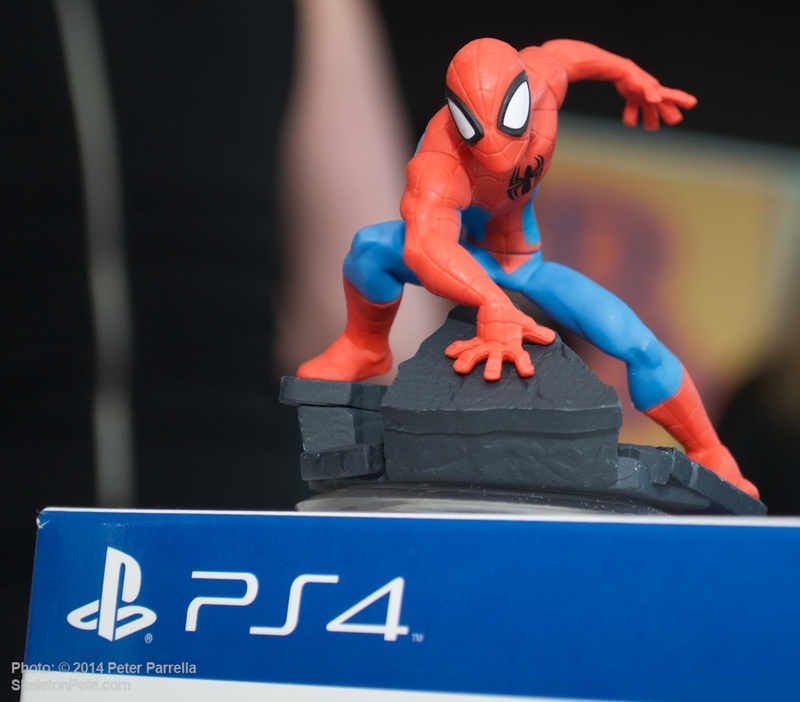 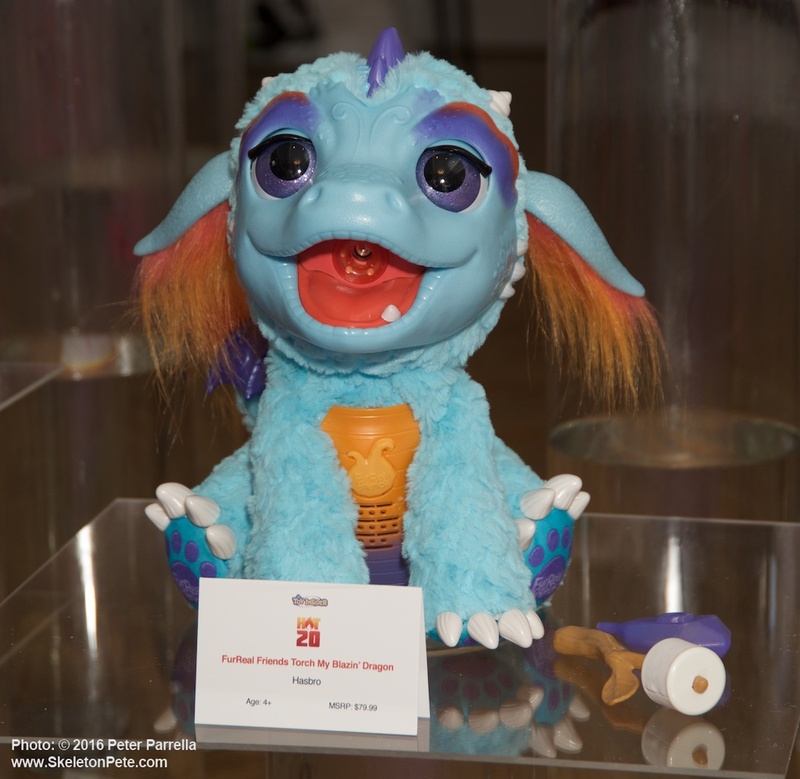 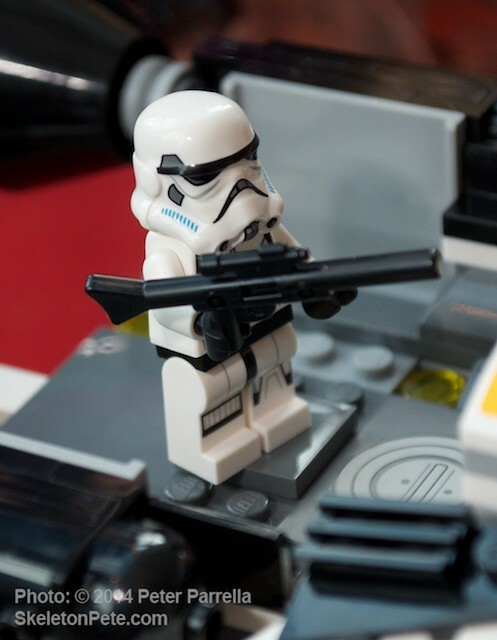 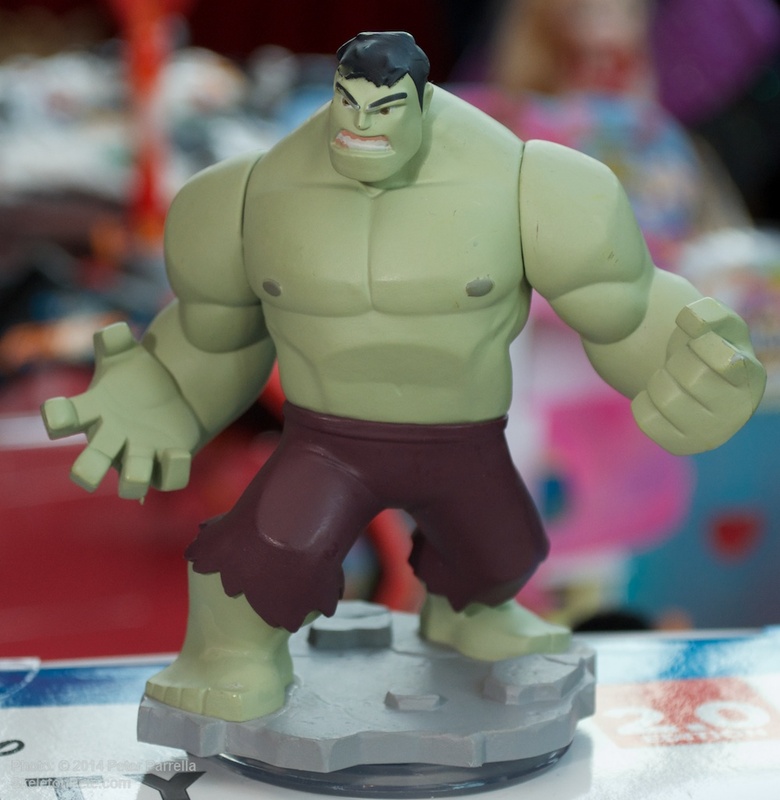 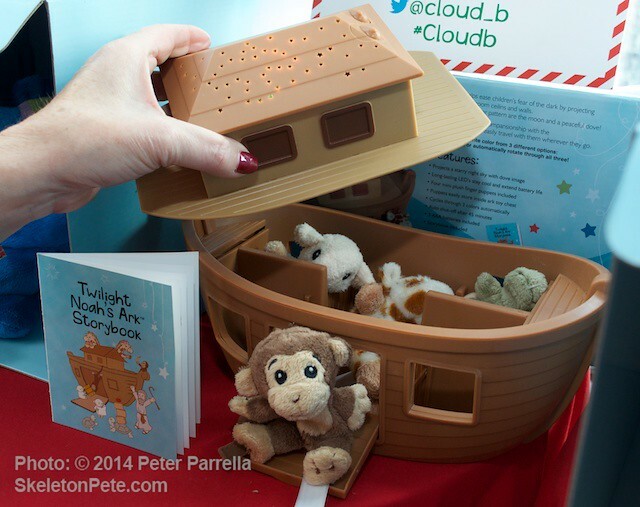 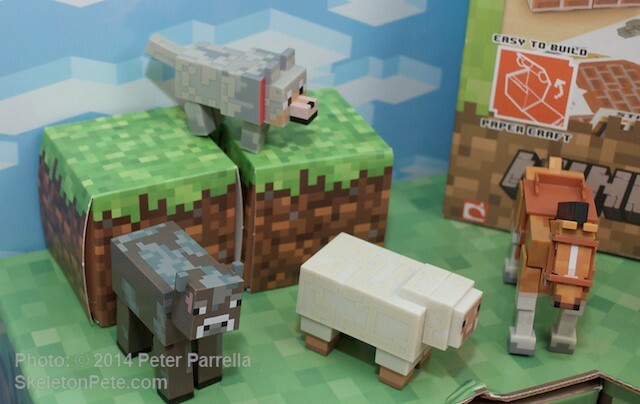 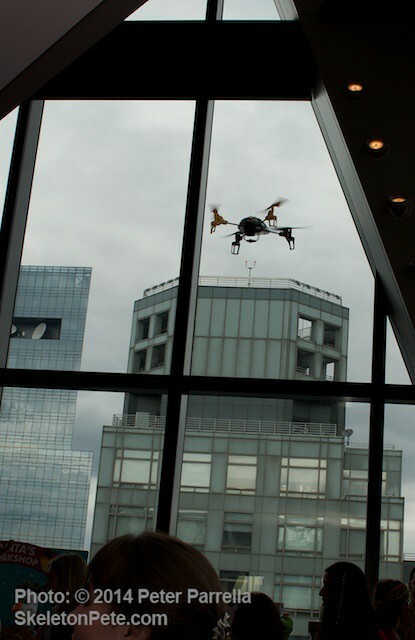 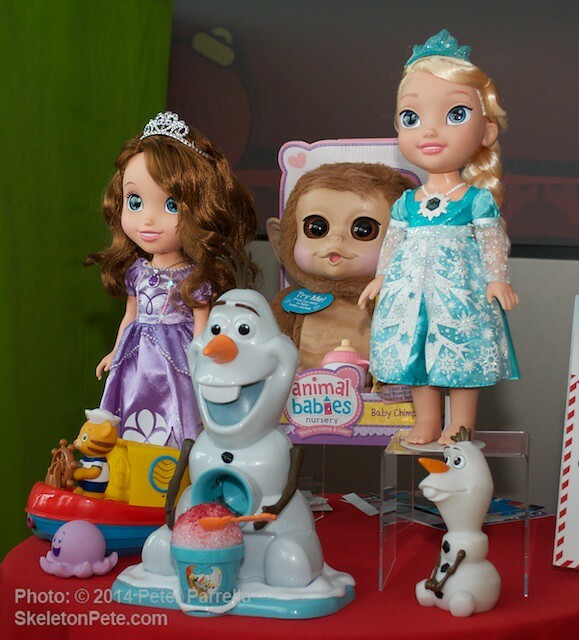 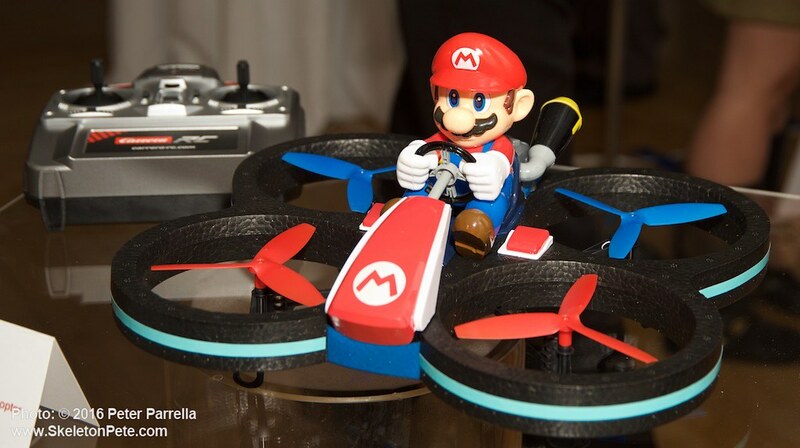 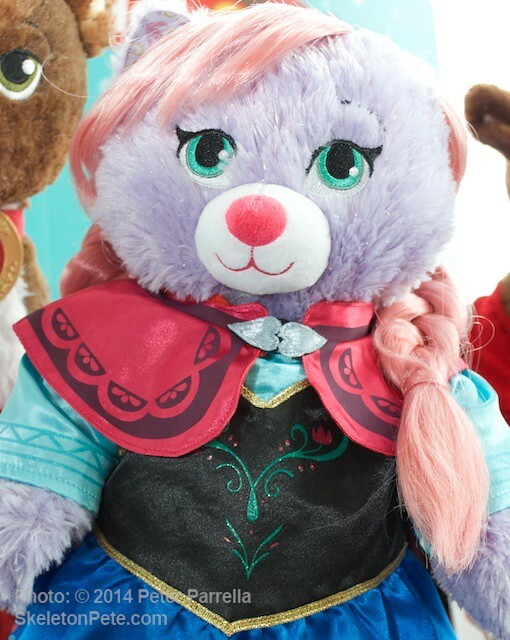 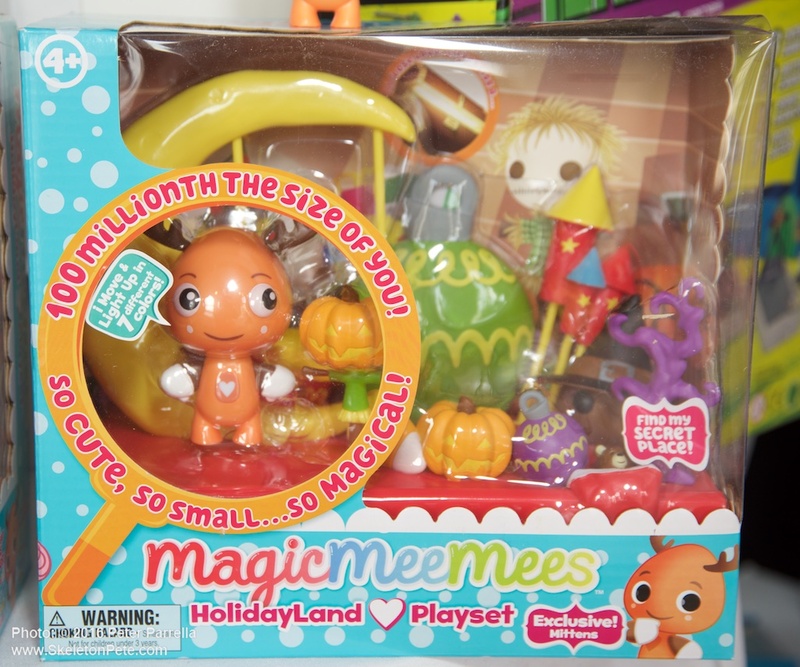 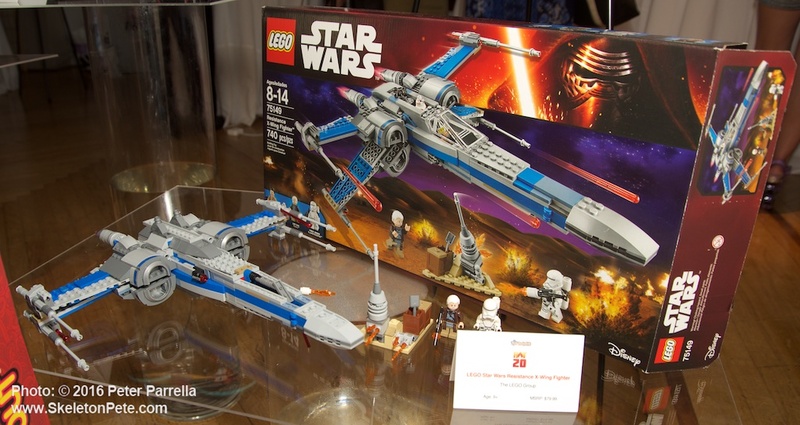 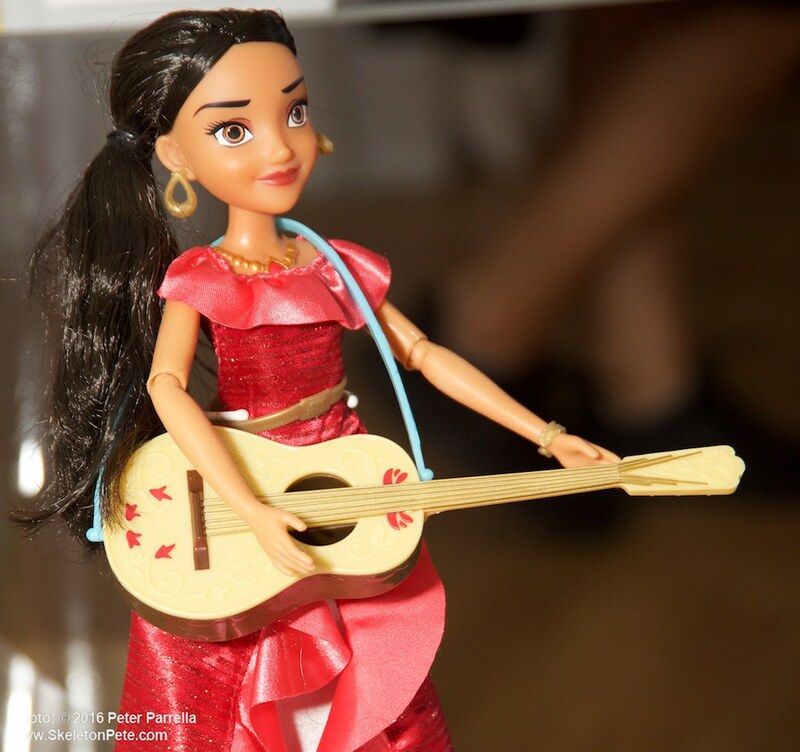 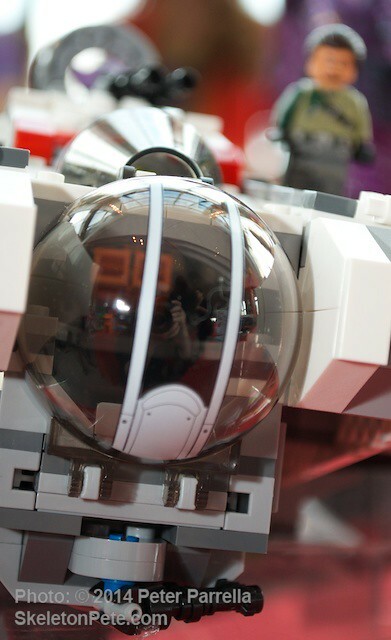 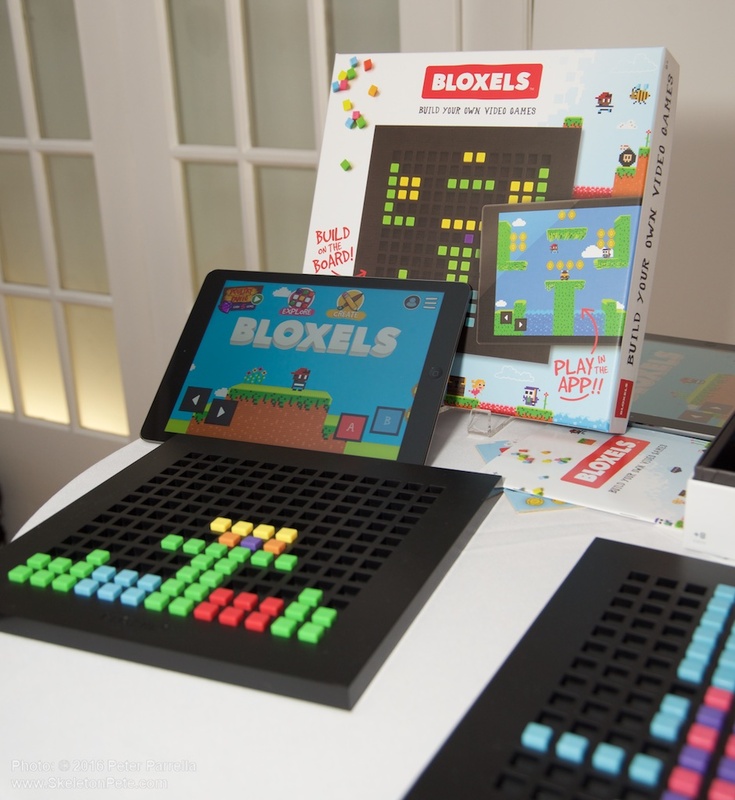 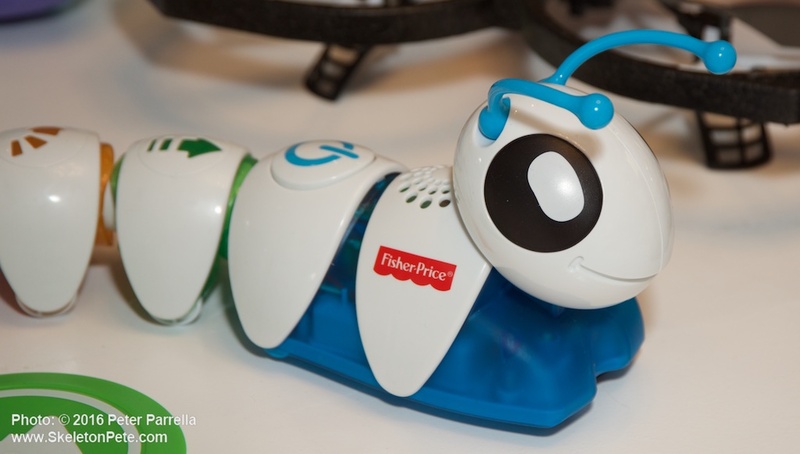 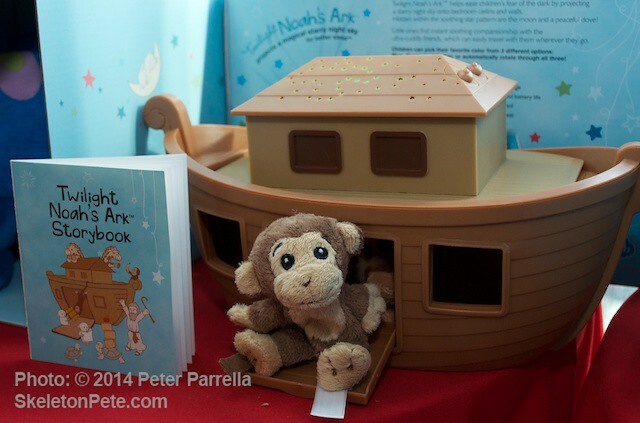 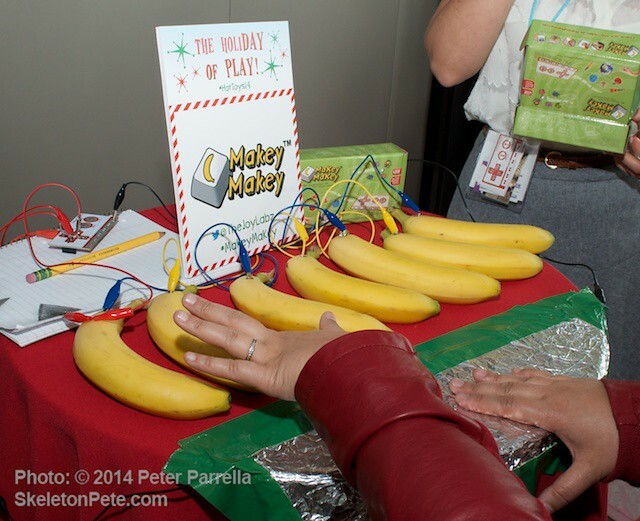 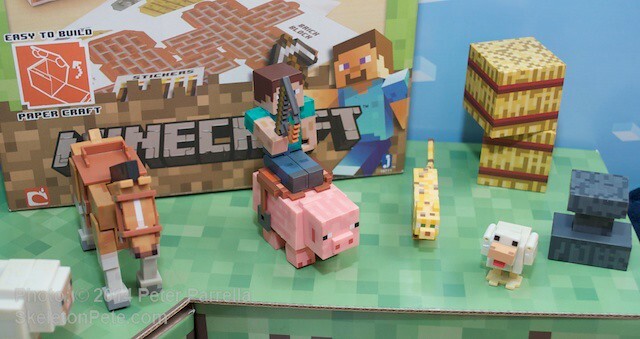 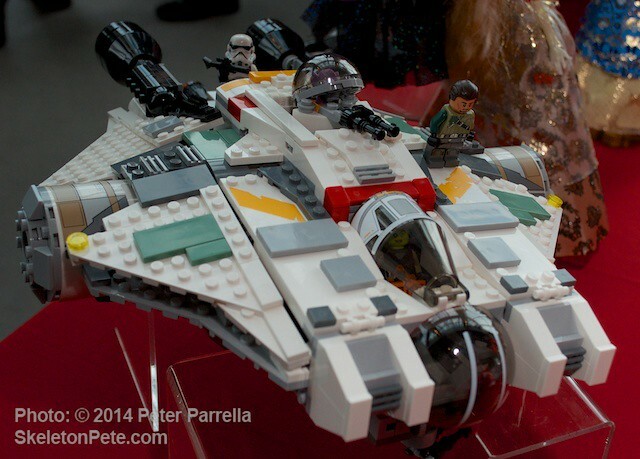 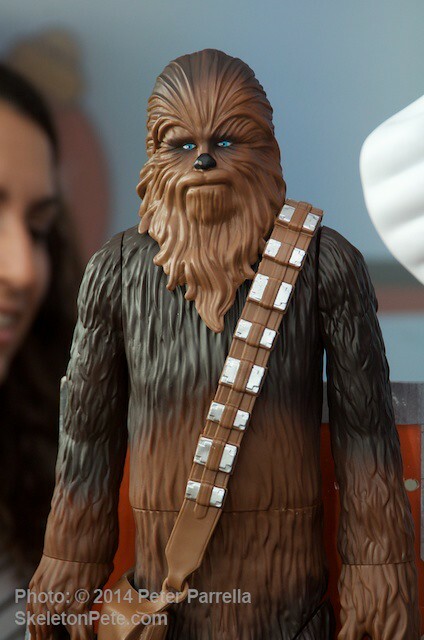 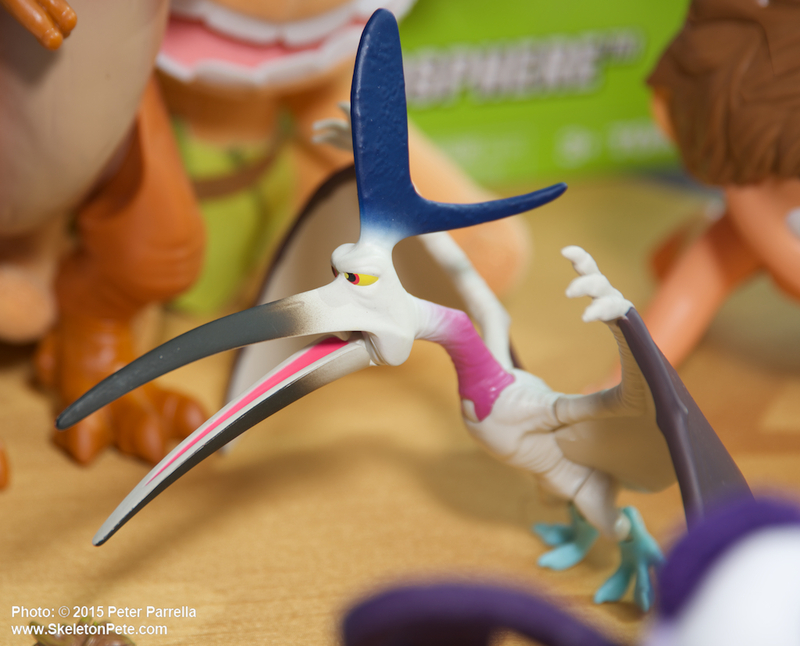 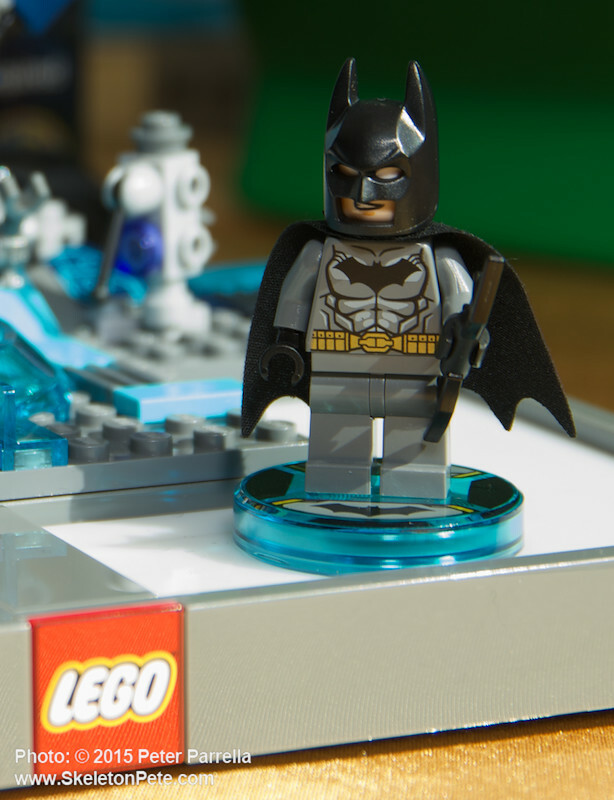 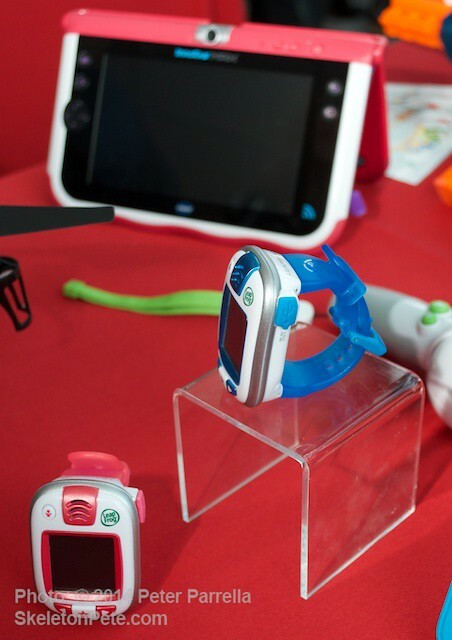 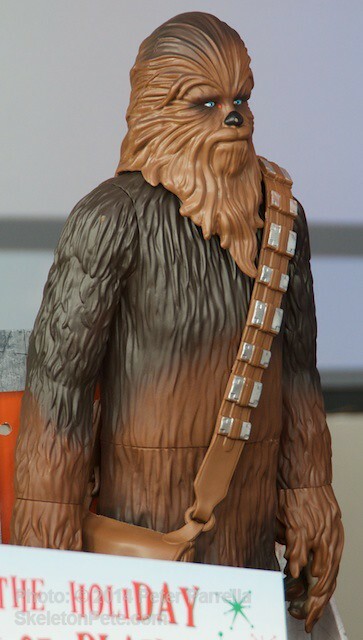 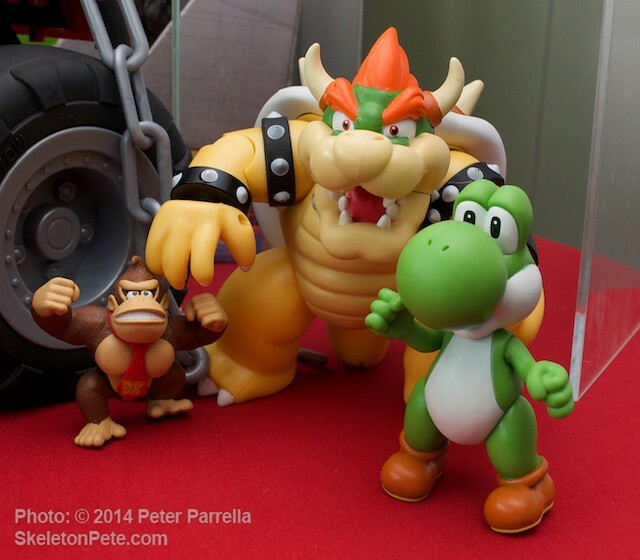 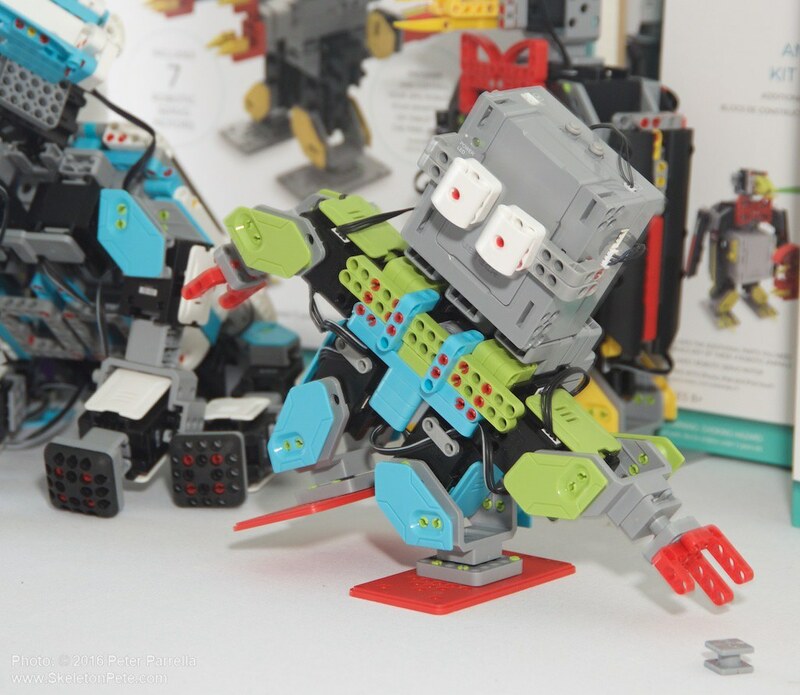 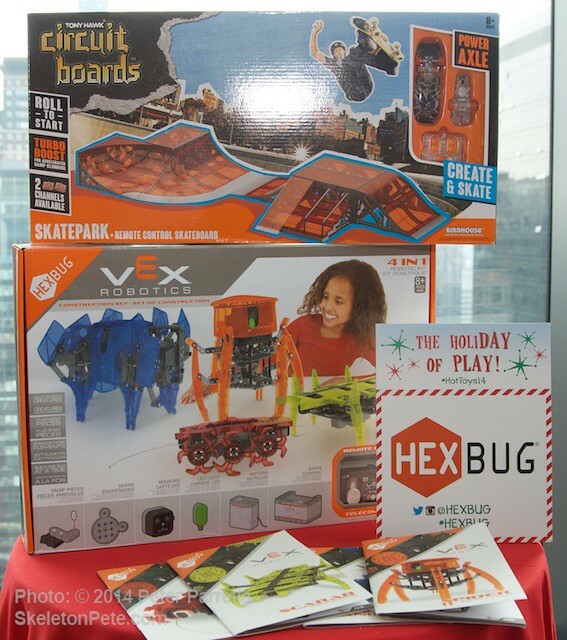 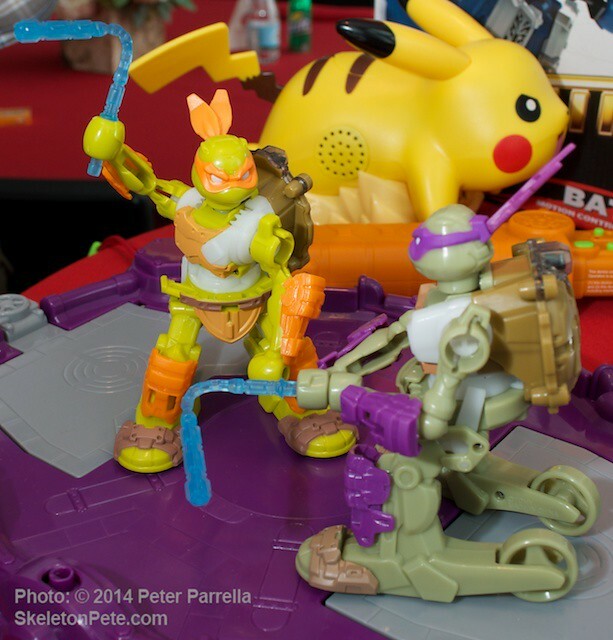 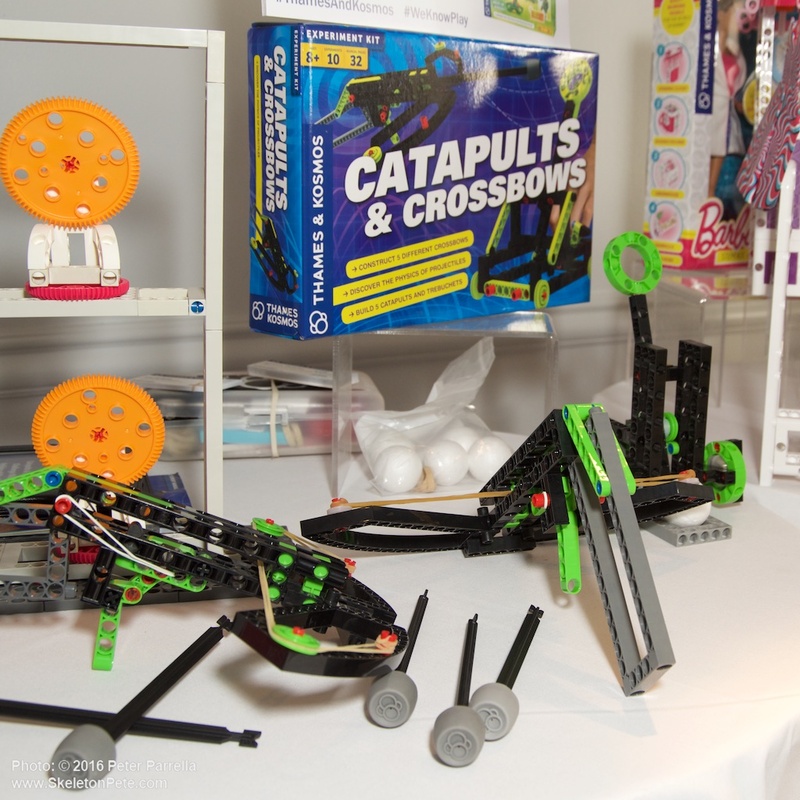 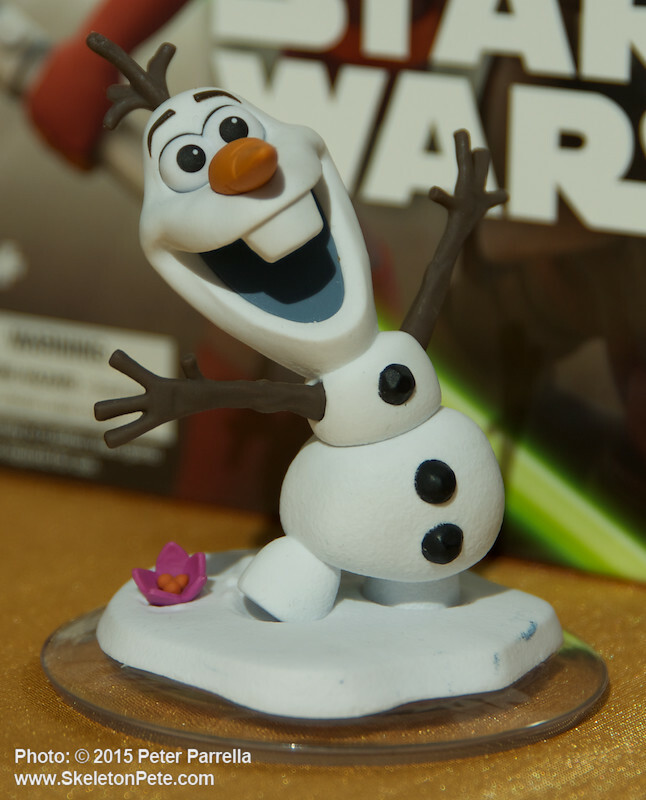 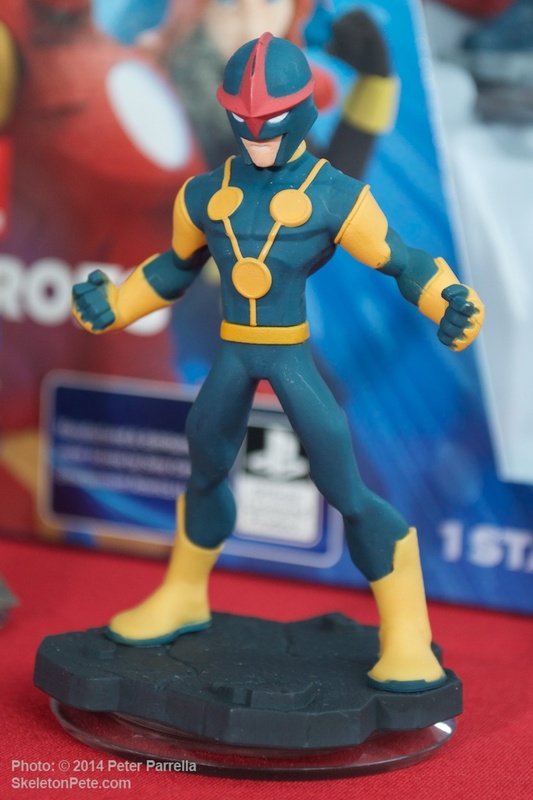 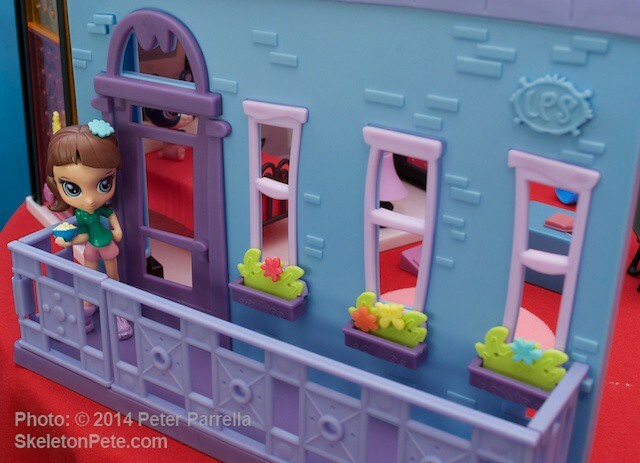 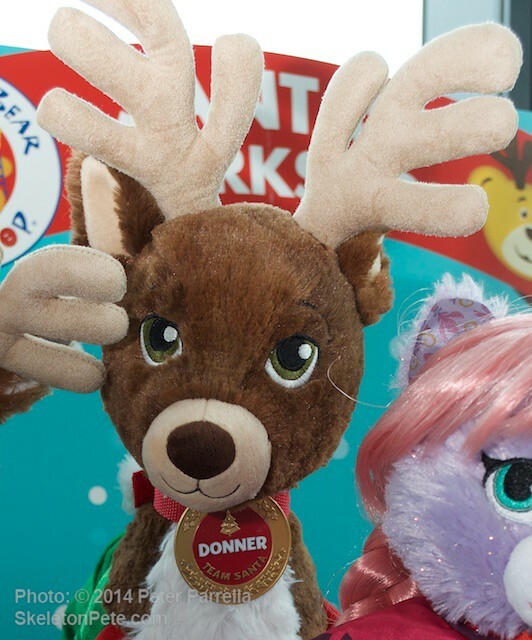 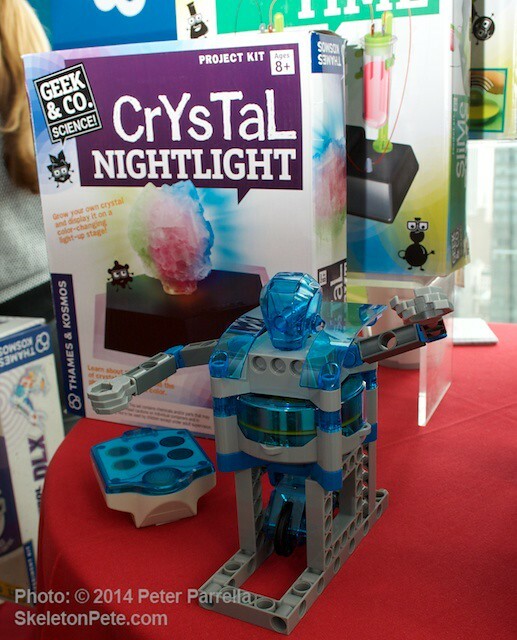 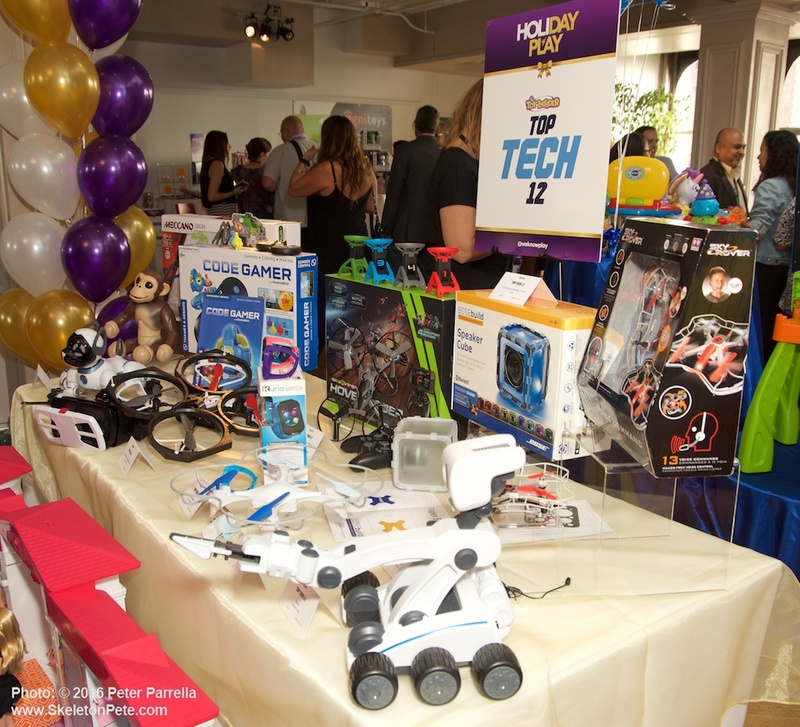 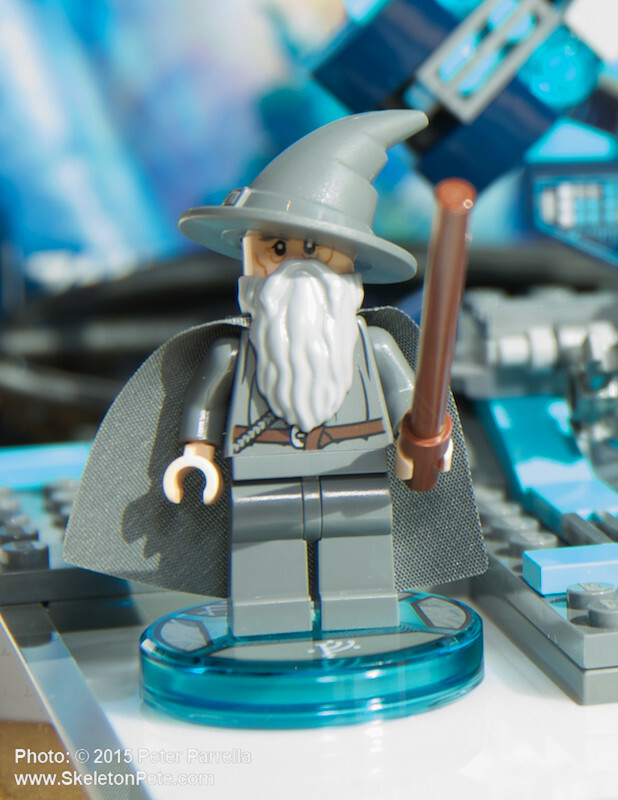 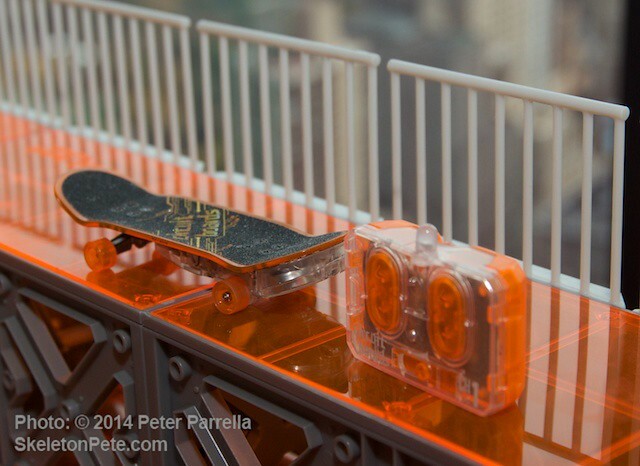 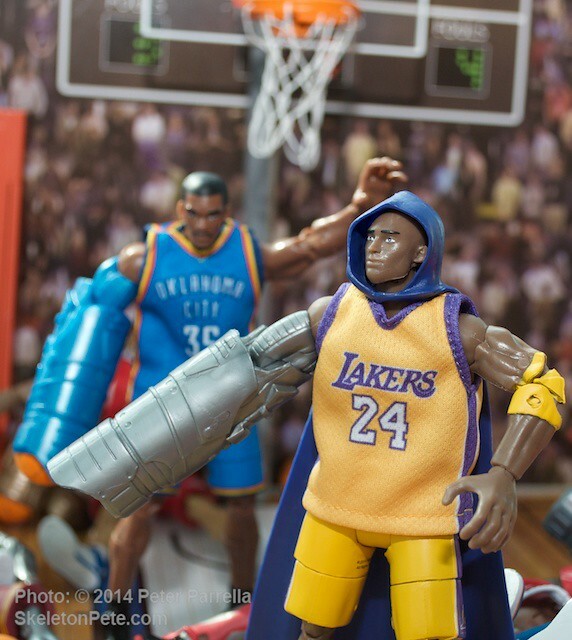 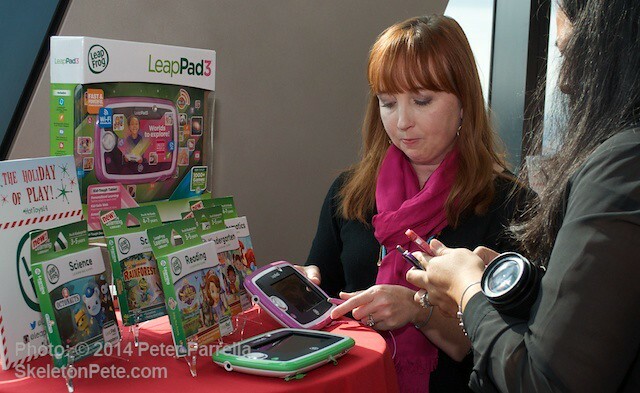 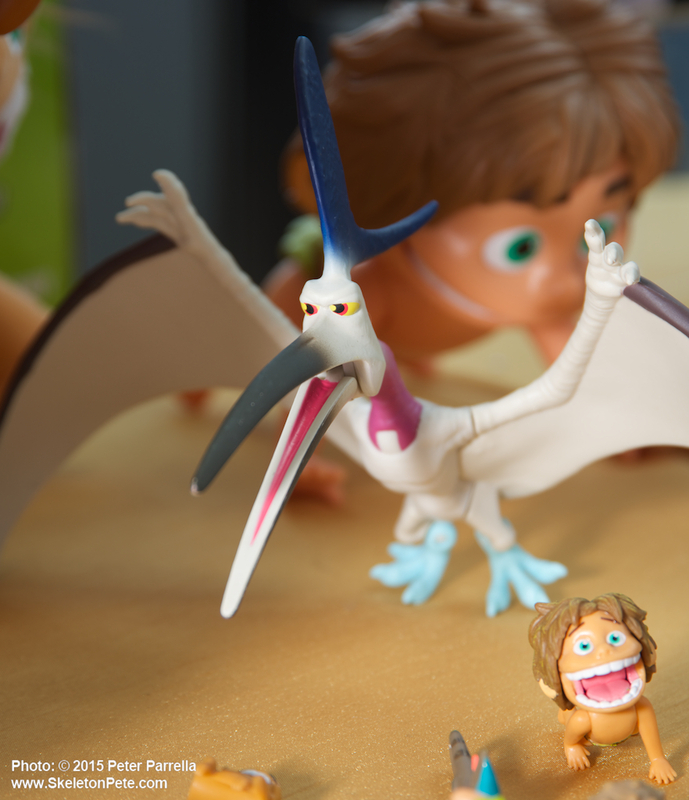 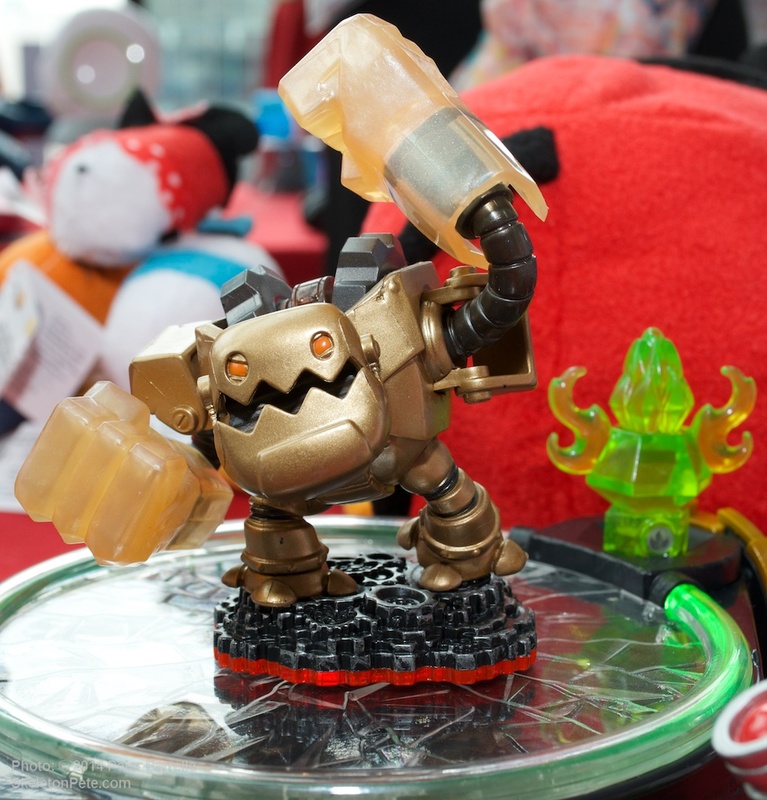 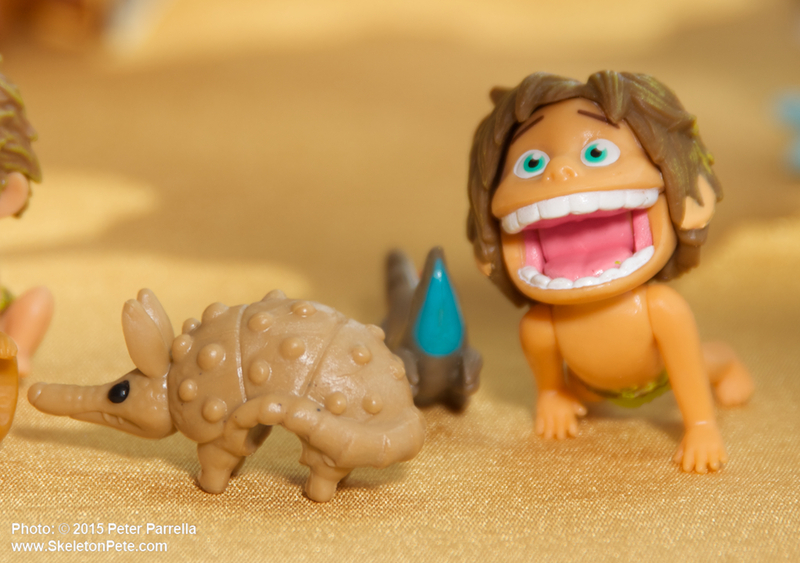 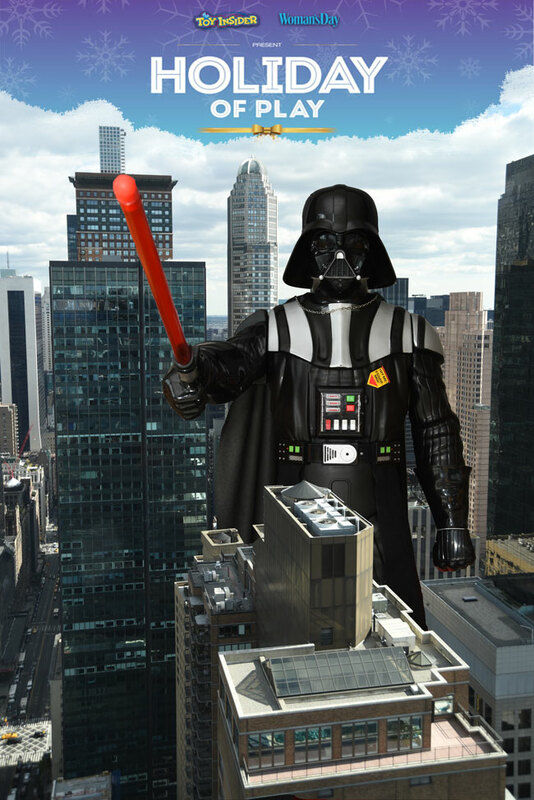 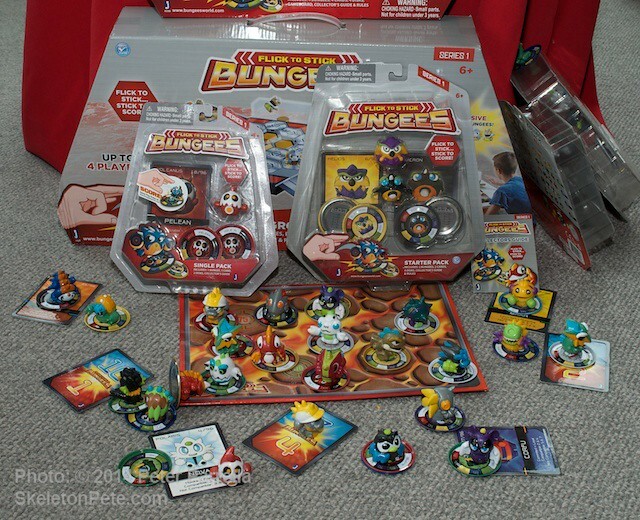 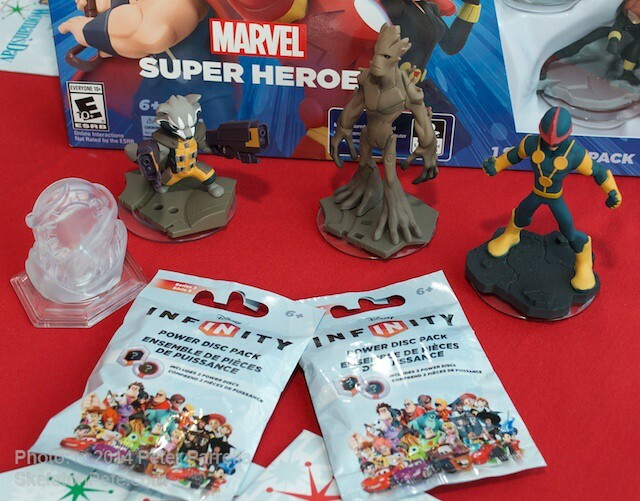 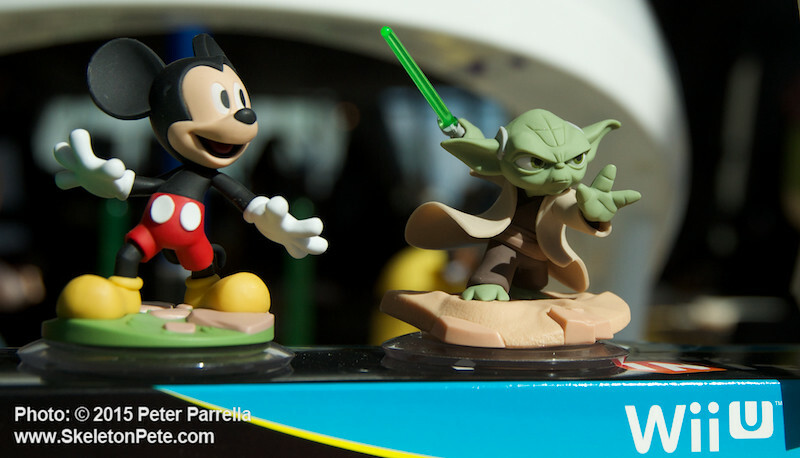 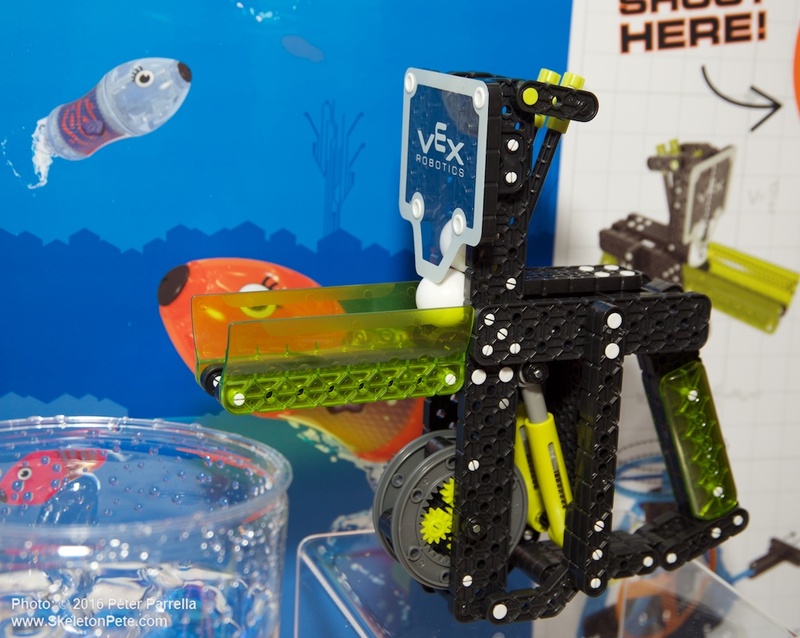 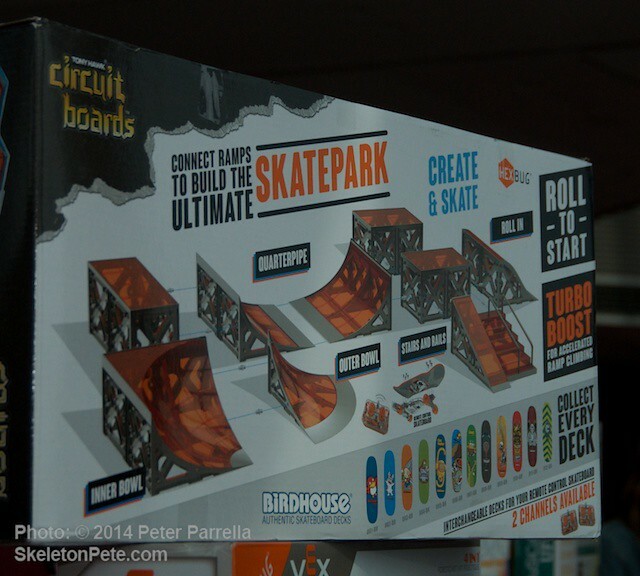 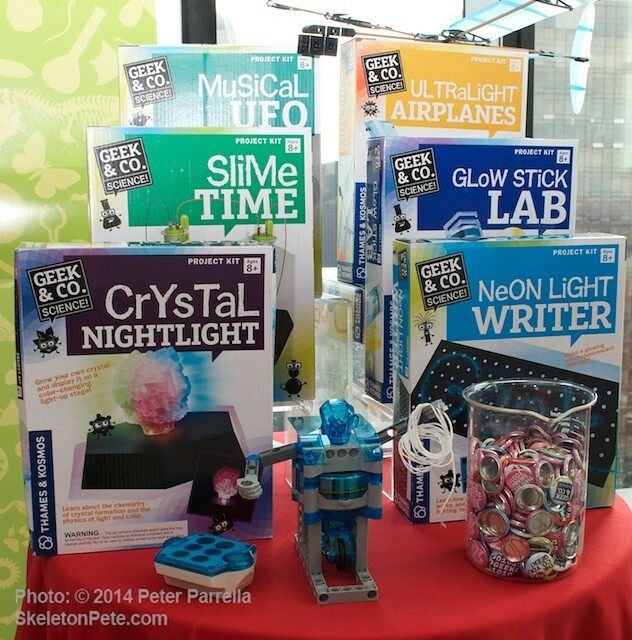 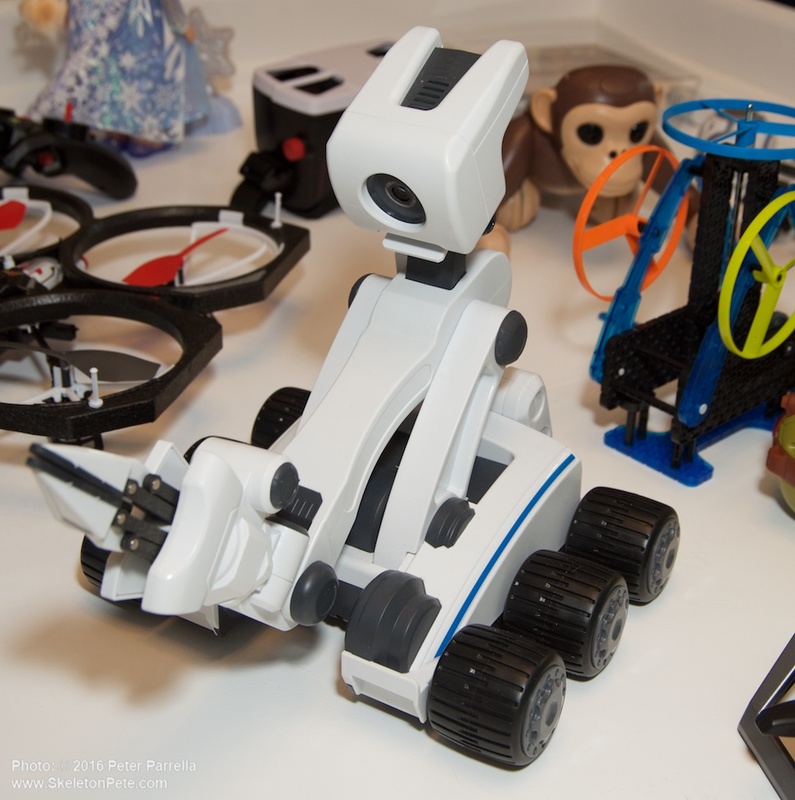 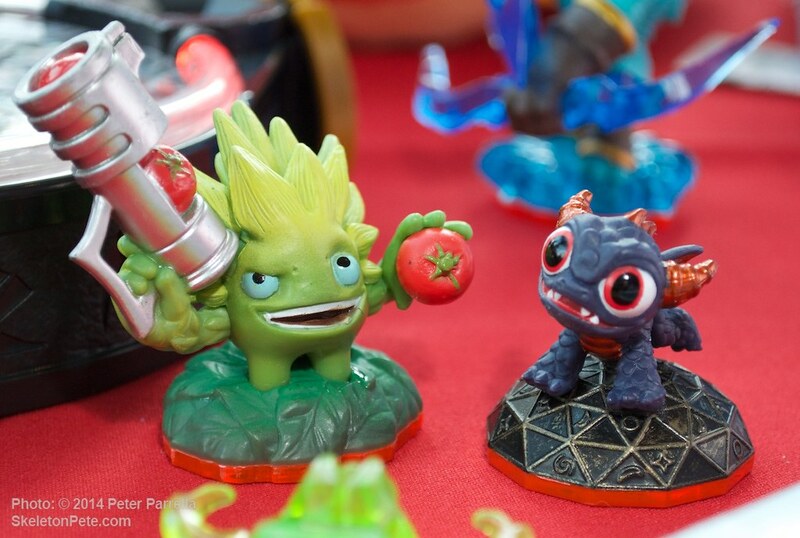 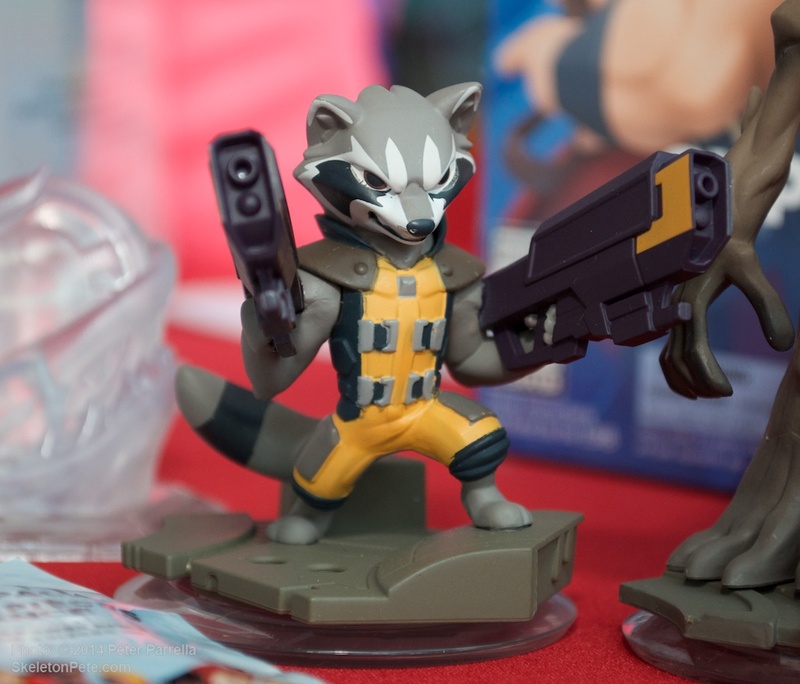 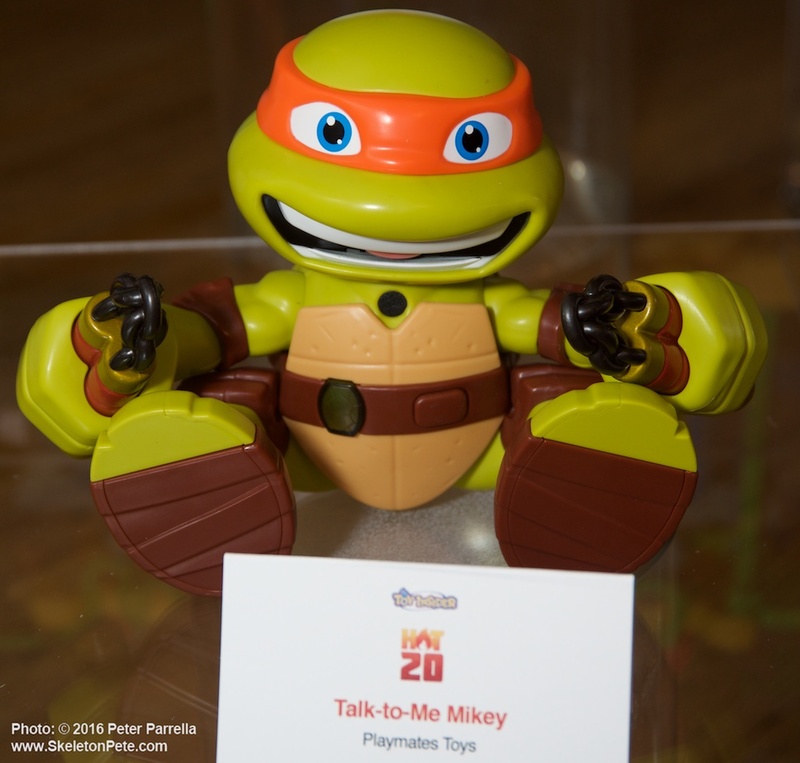 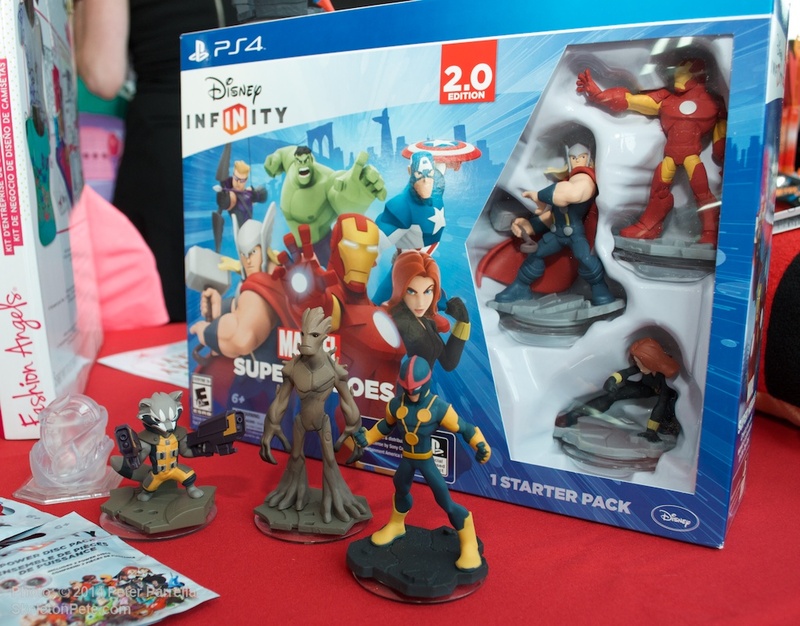 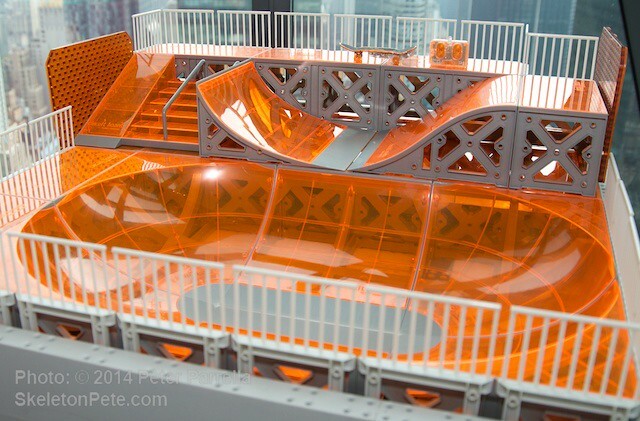 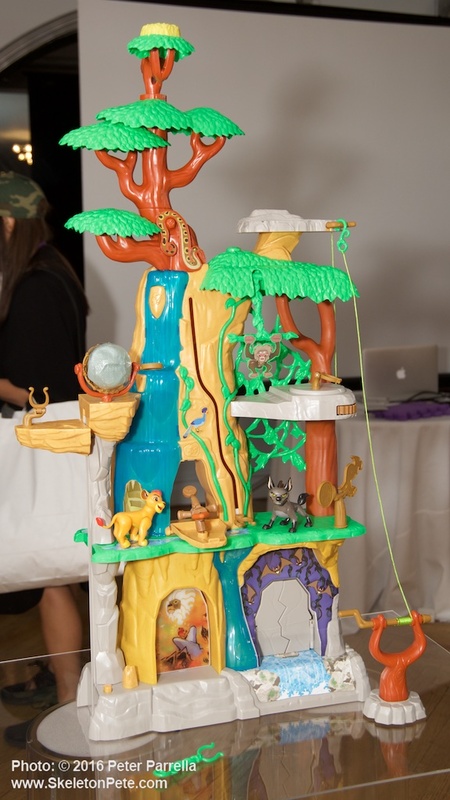 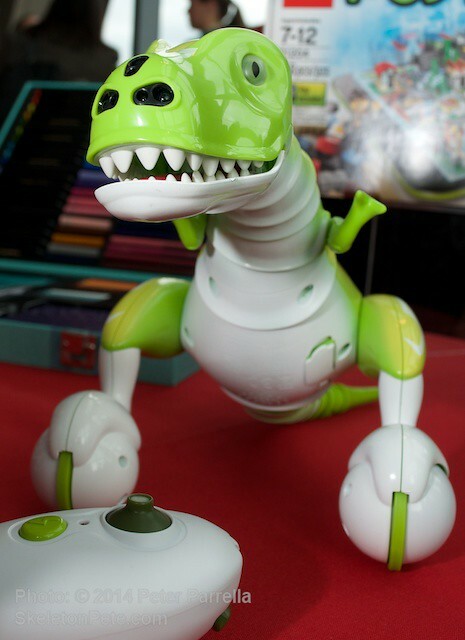 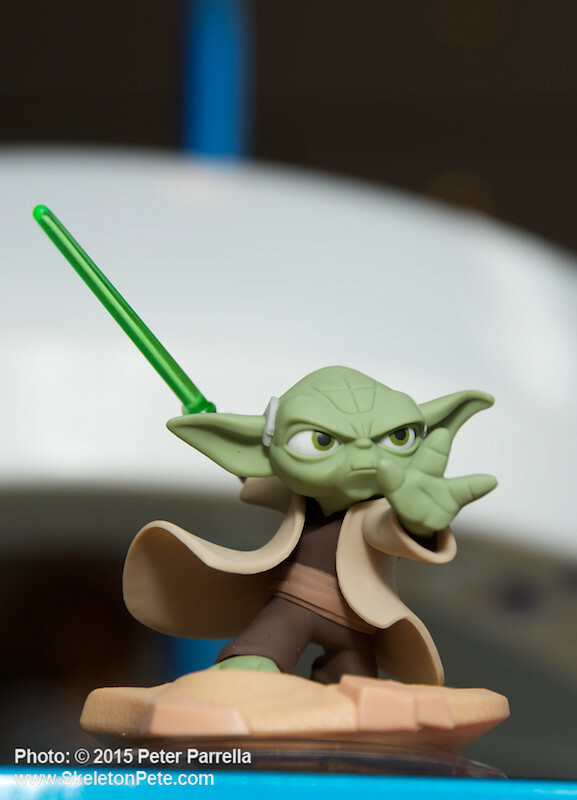 Dubbed “The HoliDAY of PLAY” the gathering was aimed at affording social media and online reporters a jump on building buzz for the best toy options of late 2014. 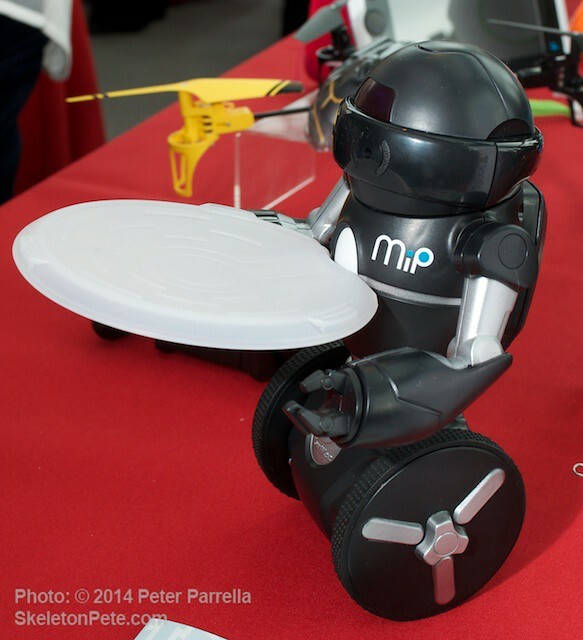 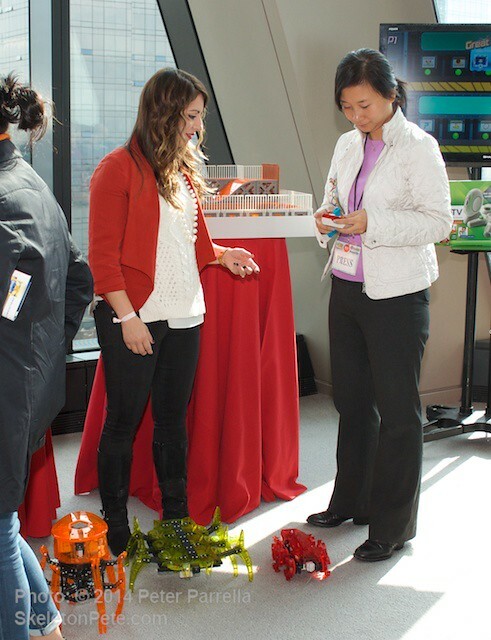 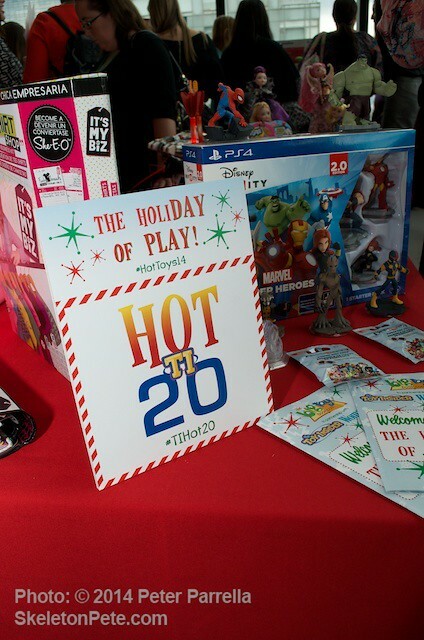 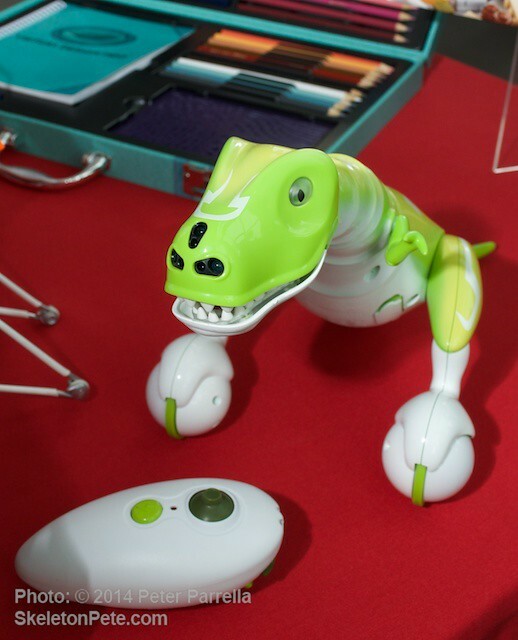 Attendees enjoyed a couple of hours of hands-on experience and information gathering directly from manufacturers with a focus on the annual Toy Insider Hot 20 and Top Tech 12 lists. 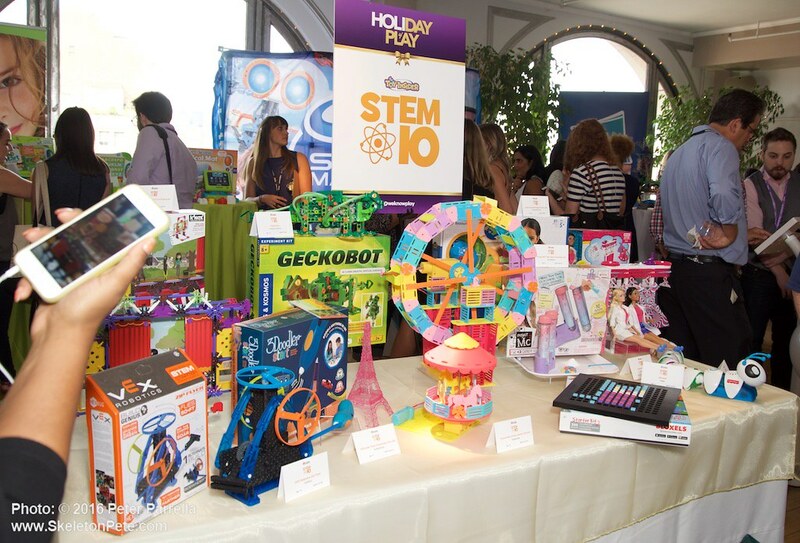 These lists (broken into age appropriate categories) and the entire 2014 Gift Guide can be found in the November issue of Woman’s Day magazine, as well as at Toy Insider online. 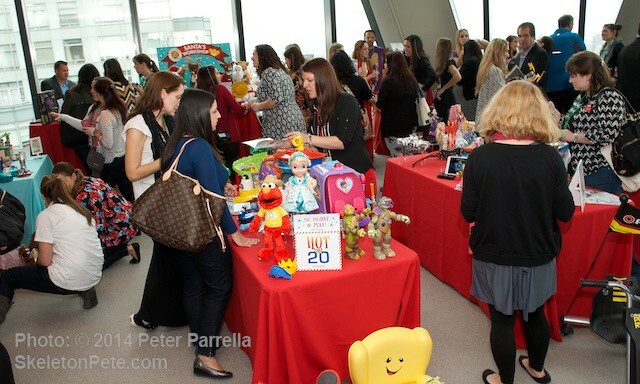 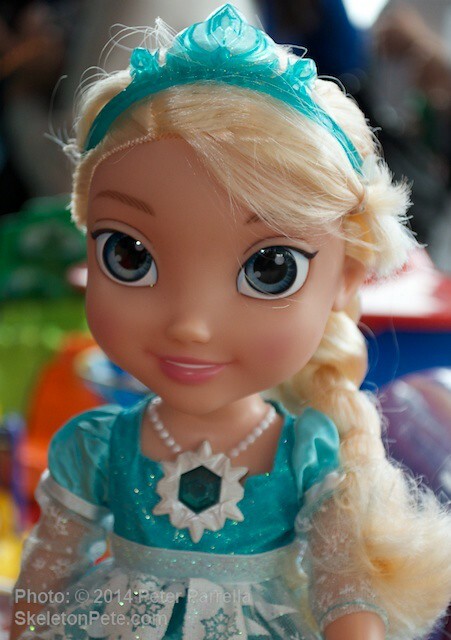 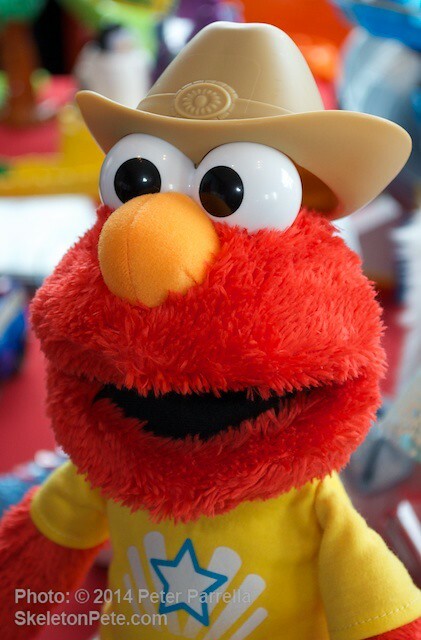 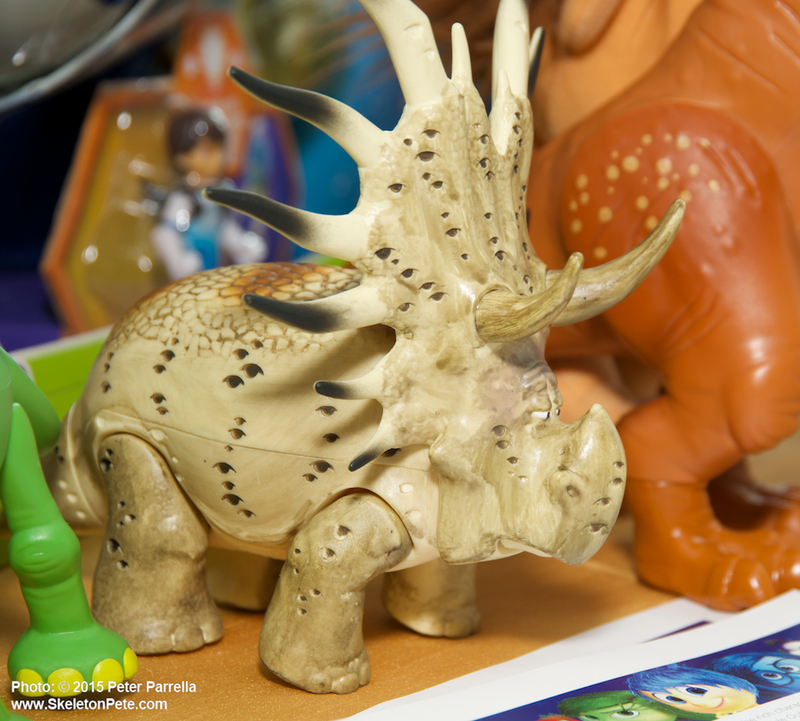 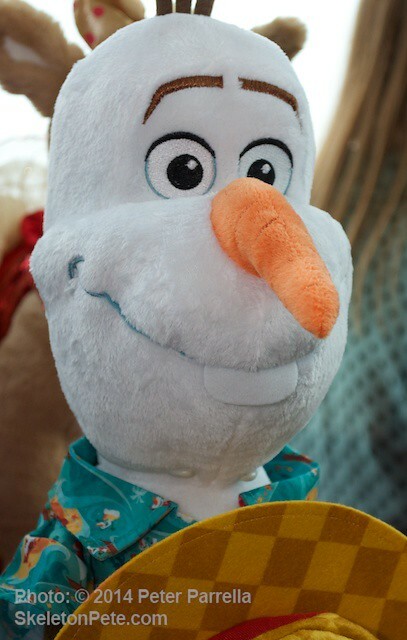 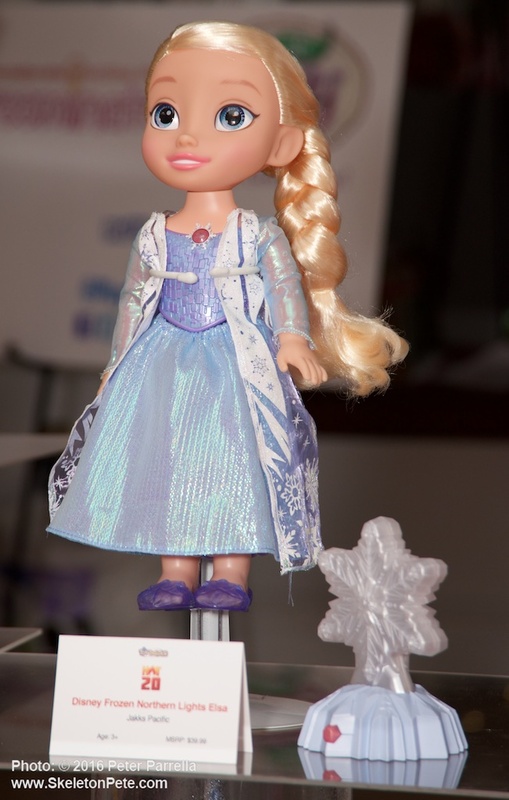 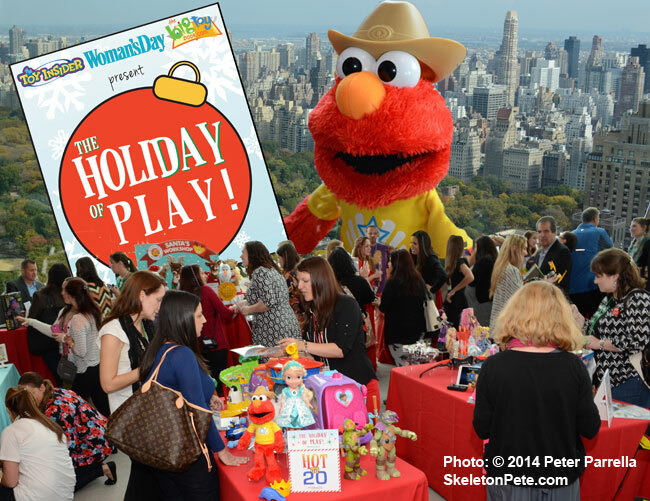 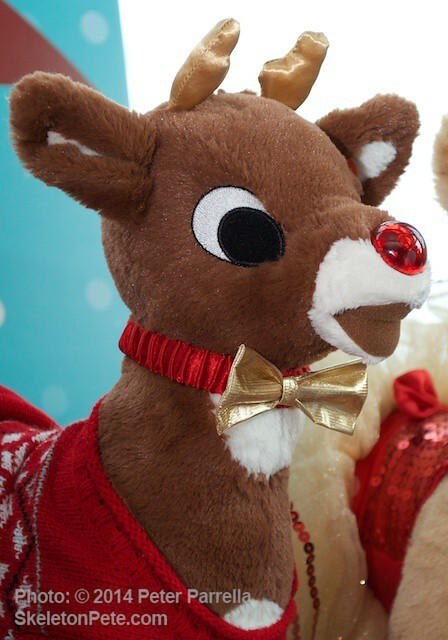 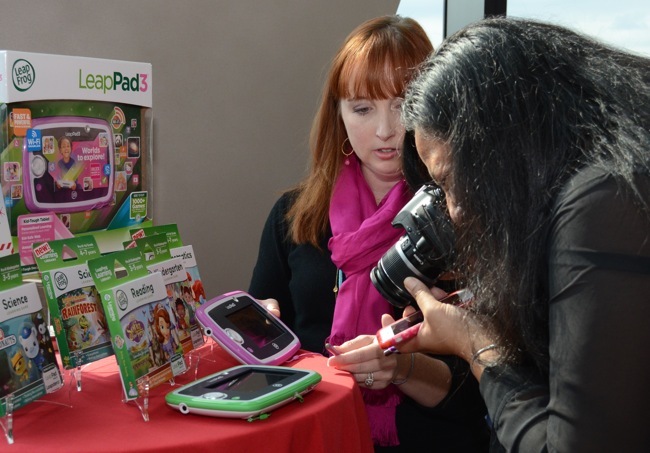 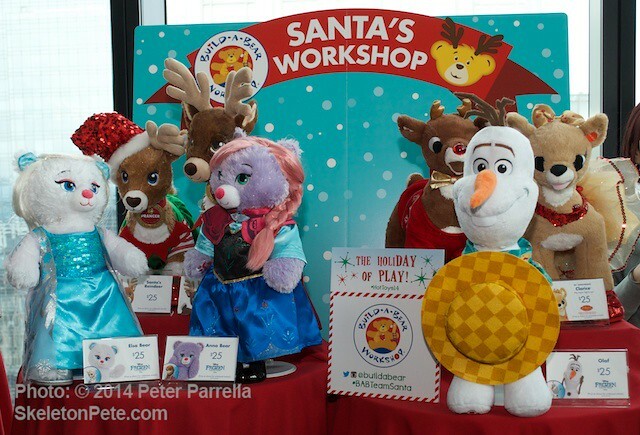 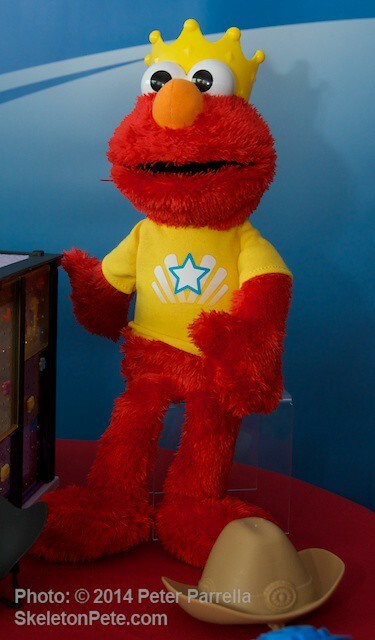 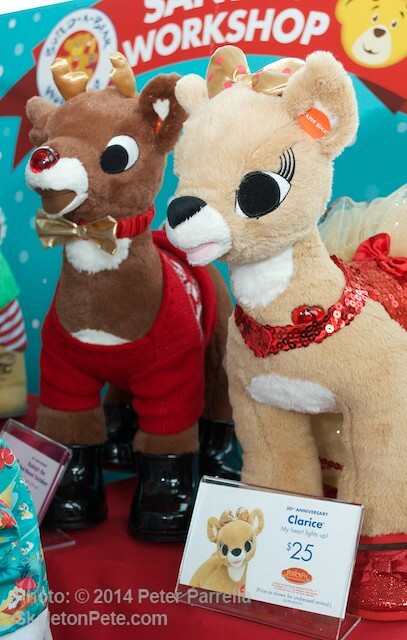 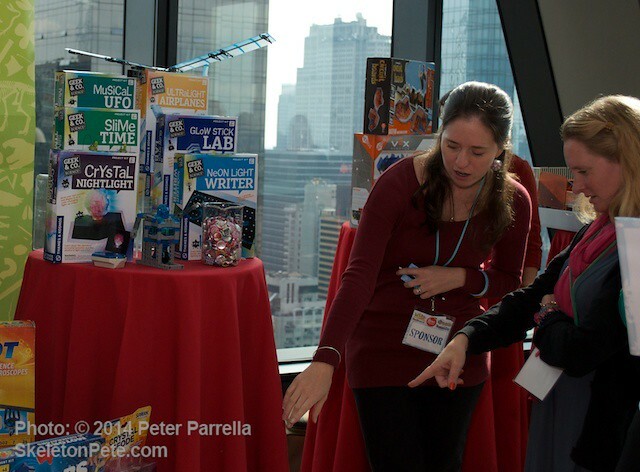 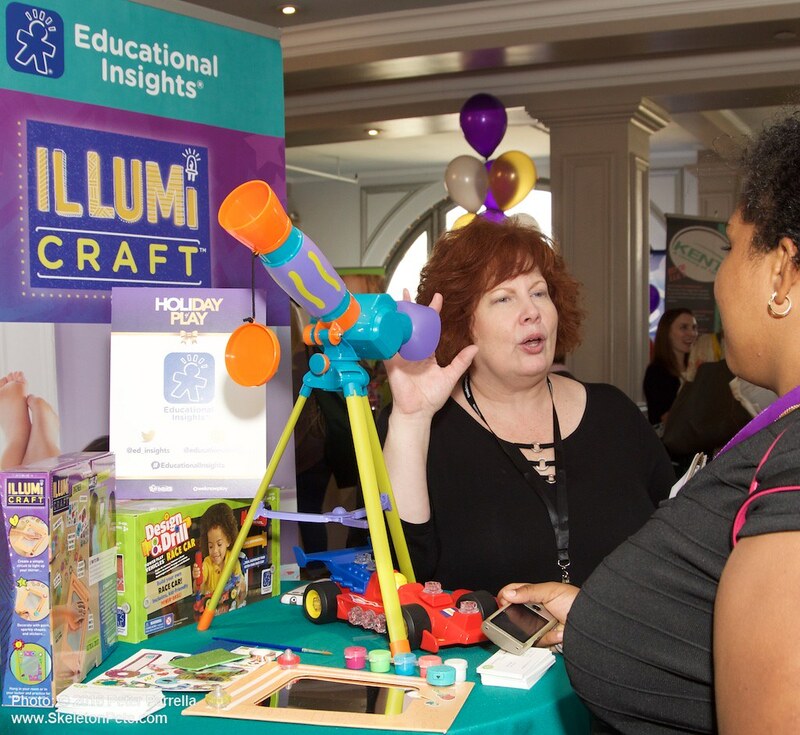 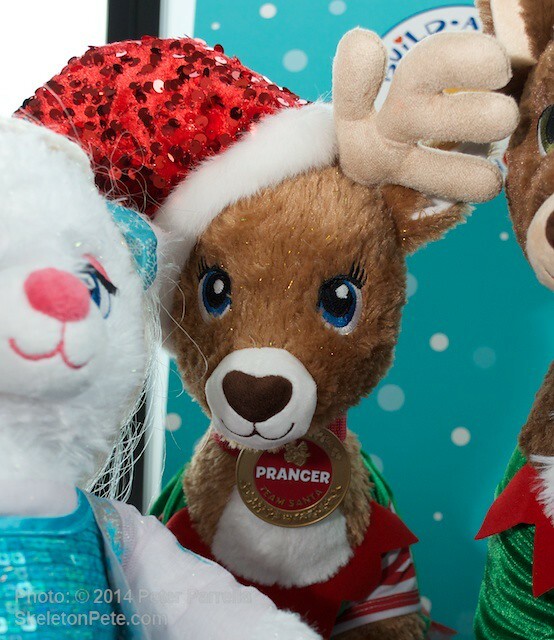 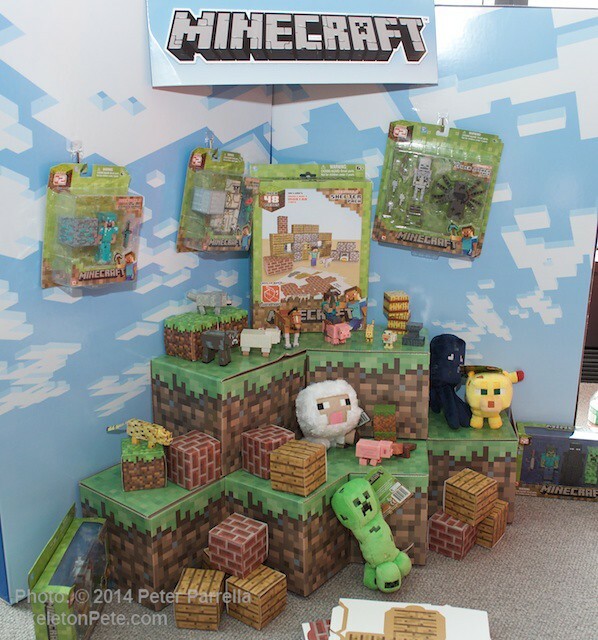 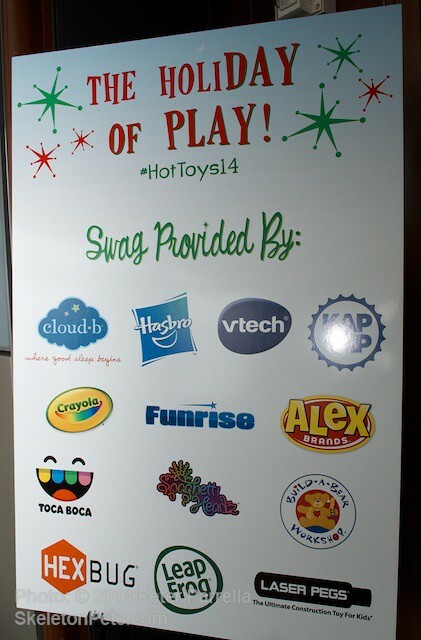 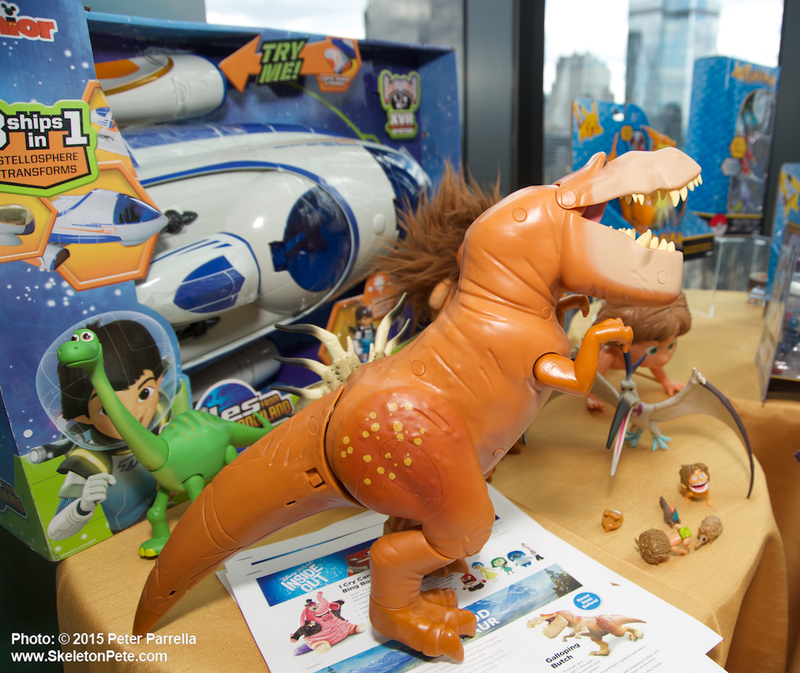 HoliDAY of PLAY Attendees Got First Hand Info from Toy Vendors, and Spun Up 16 Million Twitter Impressions. 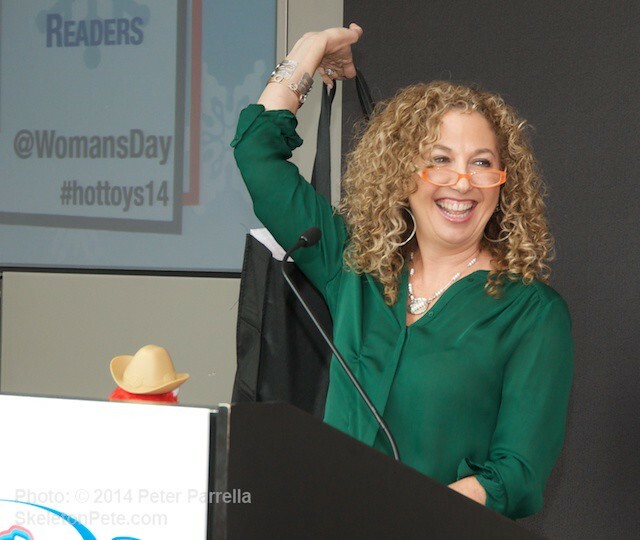 Big Toy Book Founder Laurie Schacht Hoists a Bag-O-Swag for a Lucky Winner. 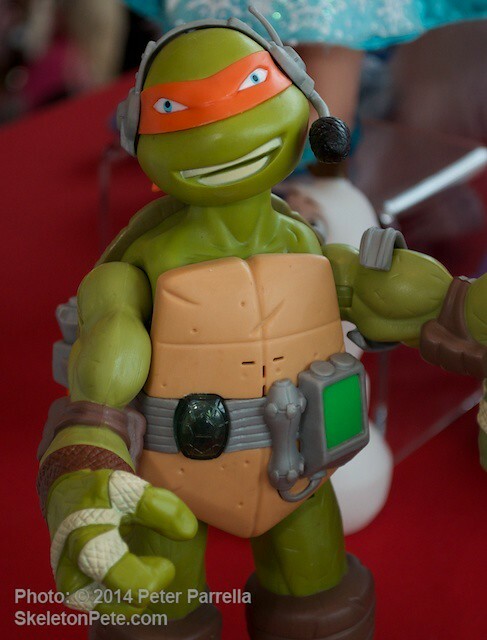 Laurie called up several brave volunteers to participate in a couple of only mildly embarrassing competitions, one of which had participants emote their best Teenage Mutant Ninja Turtle “Cowabunga Dude!” Winners walked away with nicely filled swag bags. 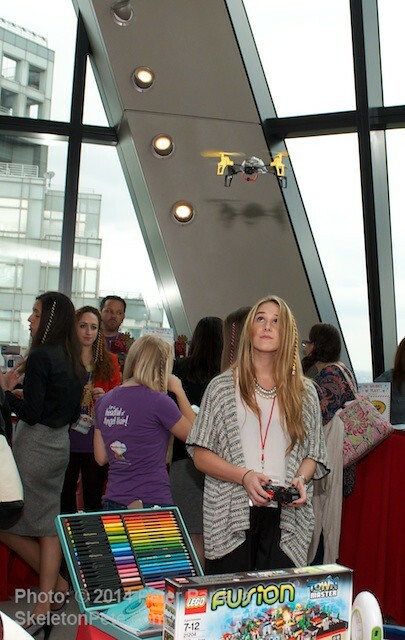 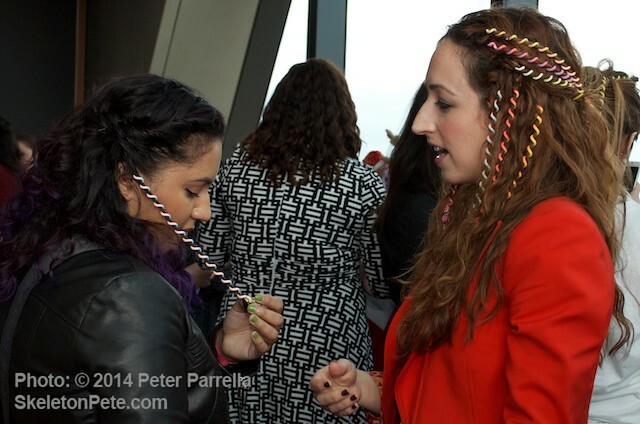 She also treated attendees to the first announcement of the 2015 Blogger Bash and Sweet Suite, which will be held on July 16 and 17 at Pier Sixty in New York City. 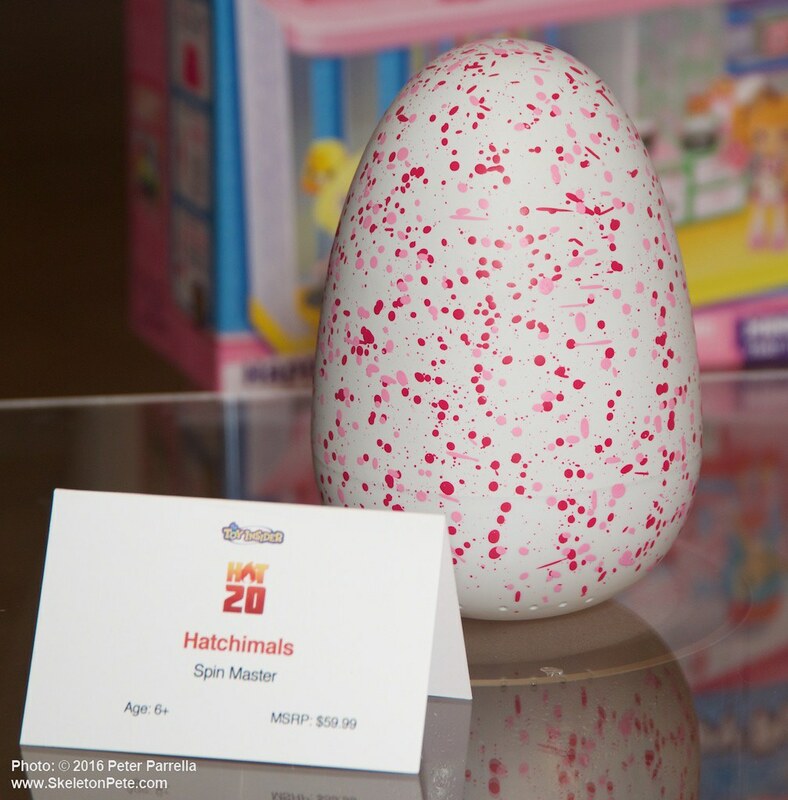 In a little over 3 hours attendees managed to spin up 16 million Twitter impressions for the #HotToys14 hashtag and hundreds of Instagram images. 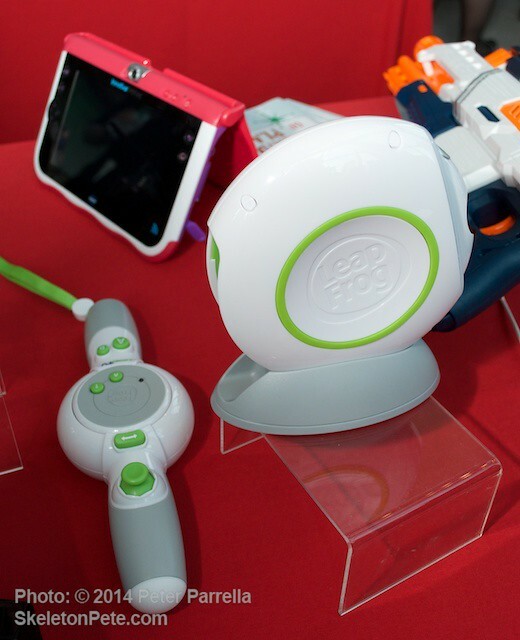 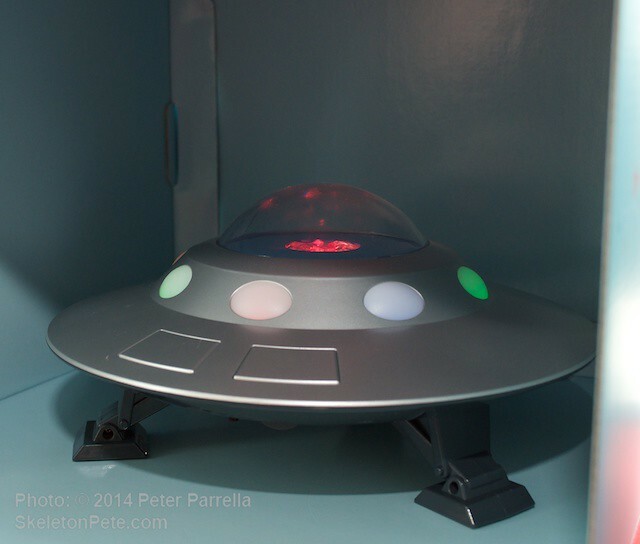 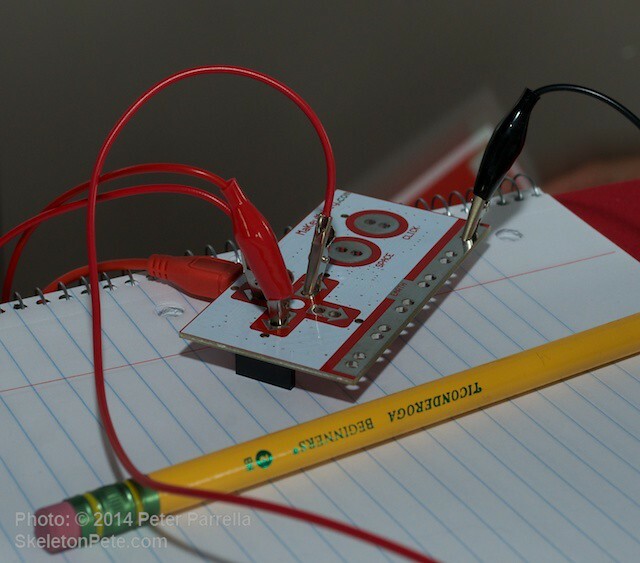 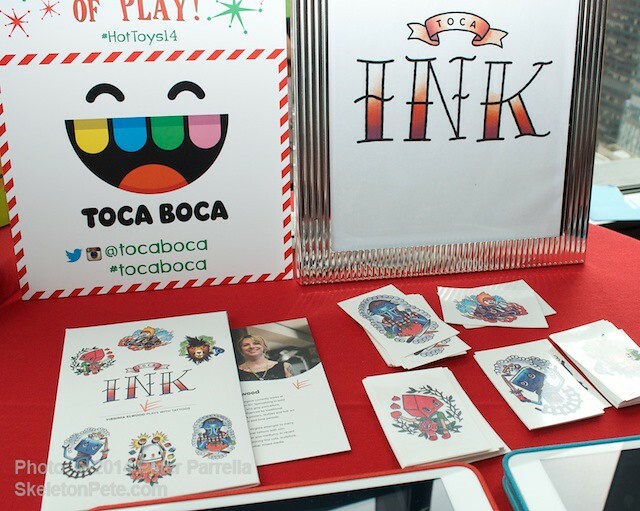 It’s an anything goes marketplace, with tech and retro play products holding equal footing. 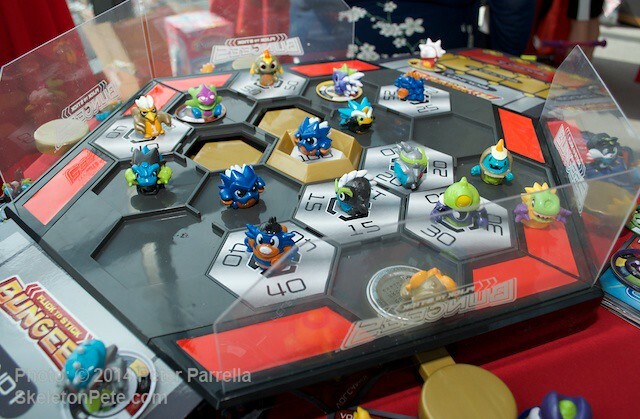 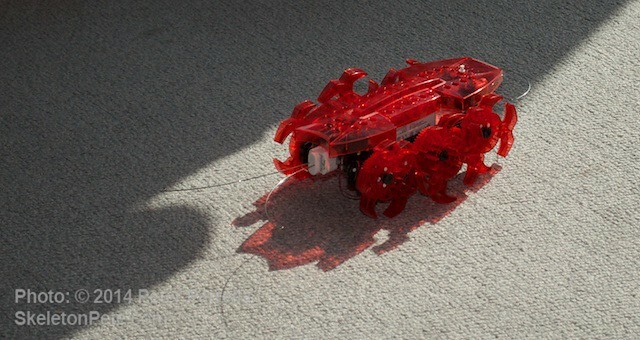 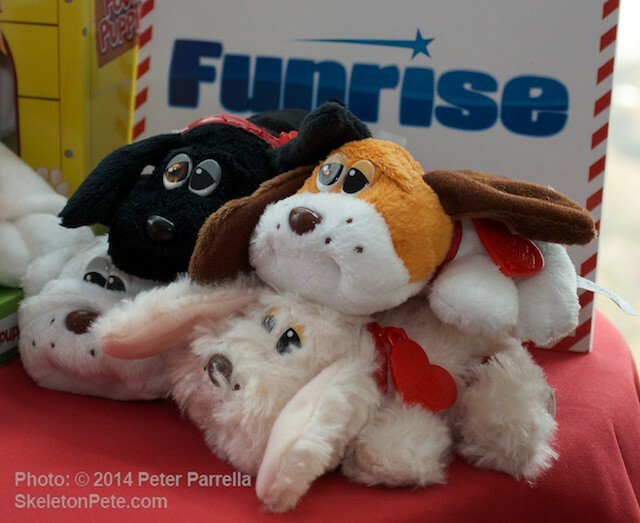 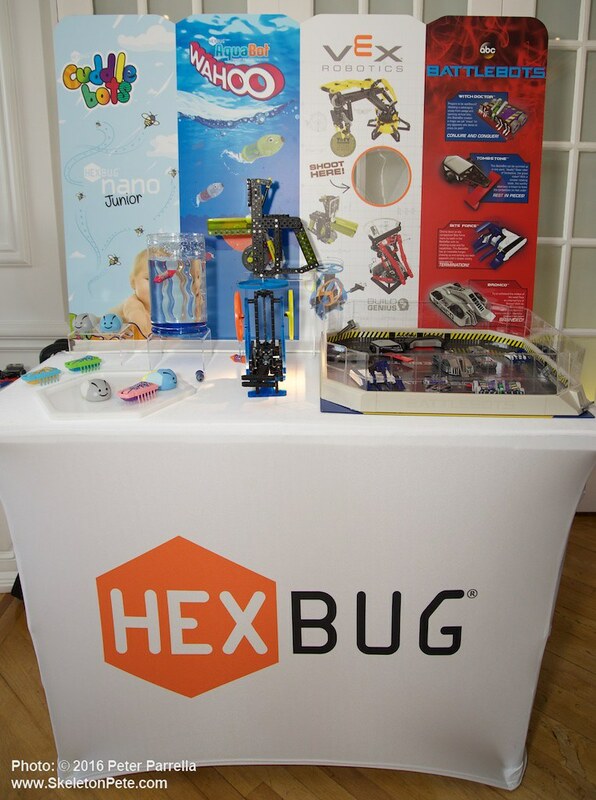 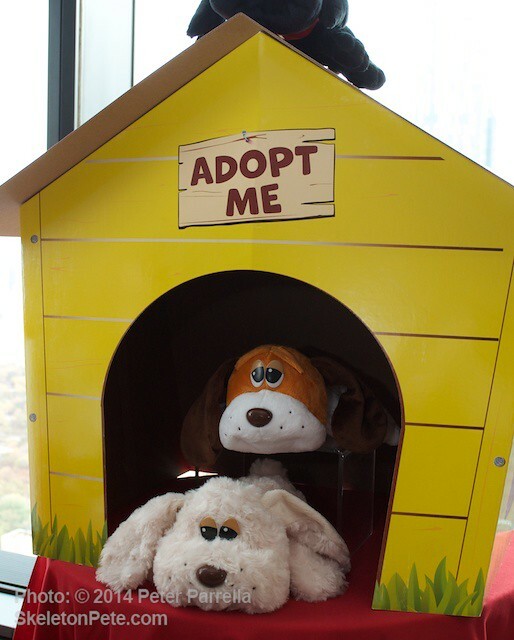 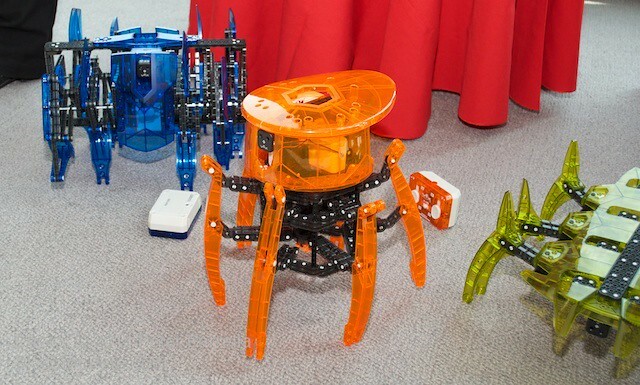 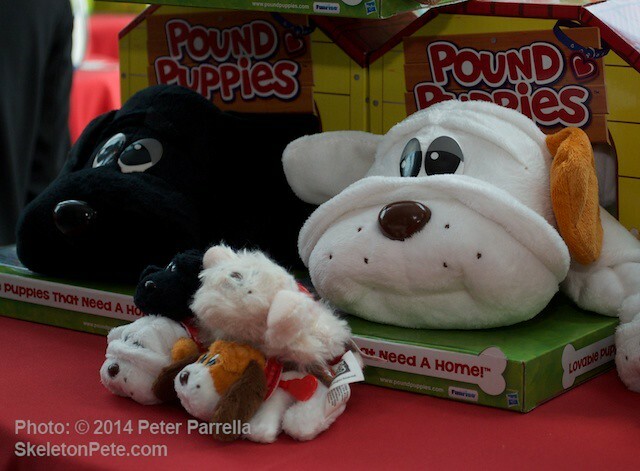 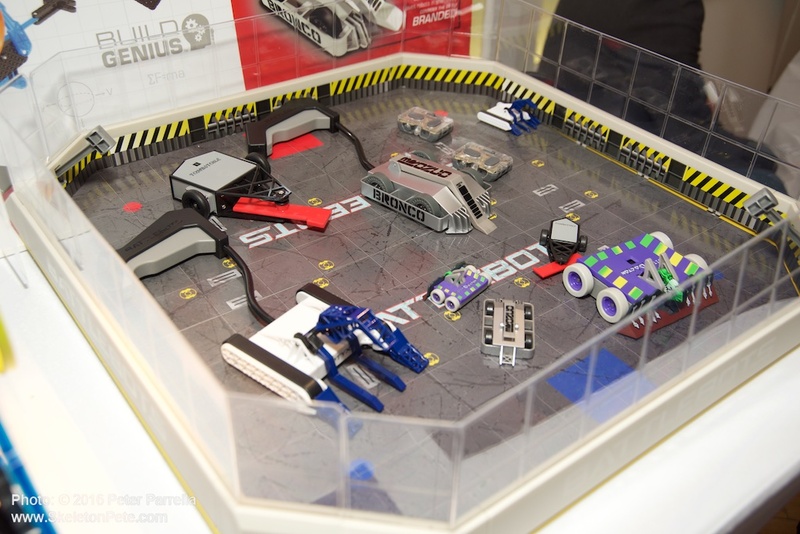 We saw choices ranging from the robotics of the constantly expanding HEXBUG line to the return of the much loved 1980’s Pound Puppies from Funrise. 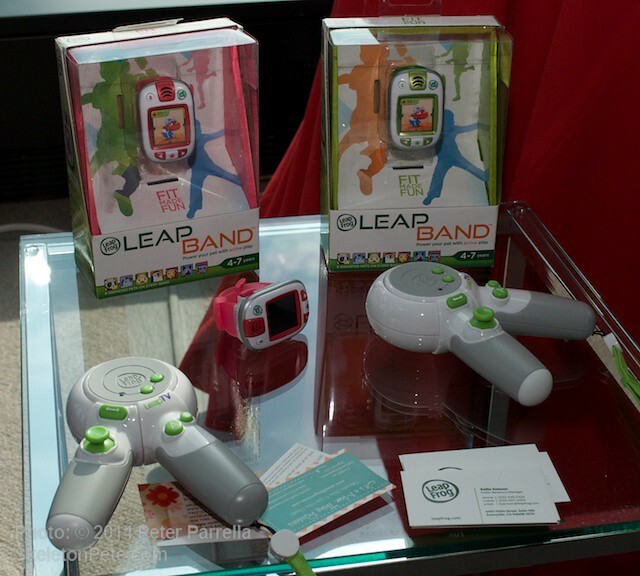 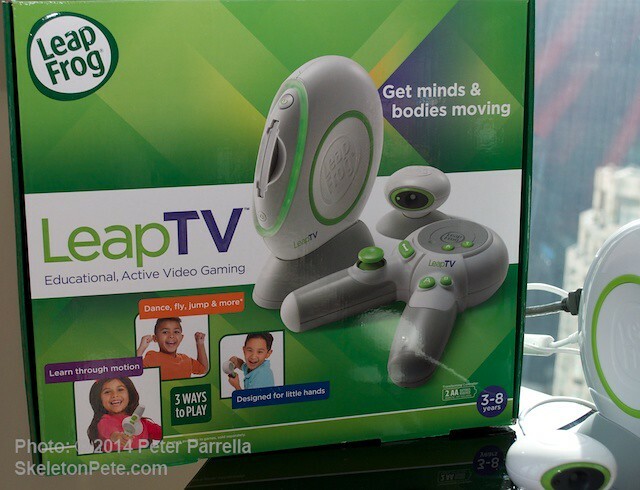 LeapFrog offers the movement motivating immersive screenplay of their new console system, while creative stalwart Crayola straddles the classic vs. digital worlds with their Virtual Designer Pro kits. 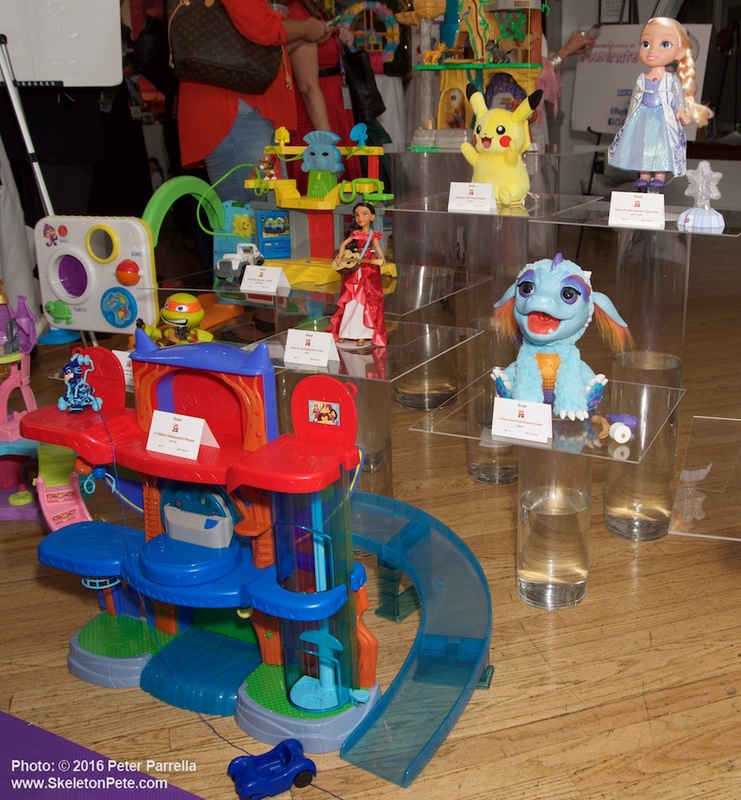 Those only represent a smattering of the multitude of possibilities which is why the helpful guidance of the annual Woman’s Day/Toy Insider supplement and Toy Insider is so valuable. 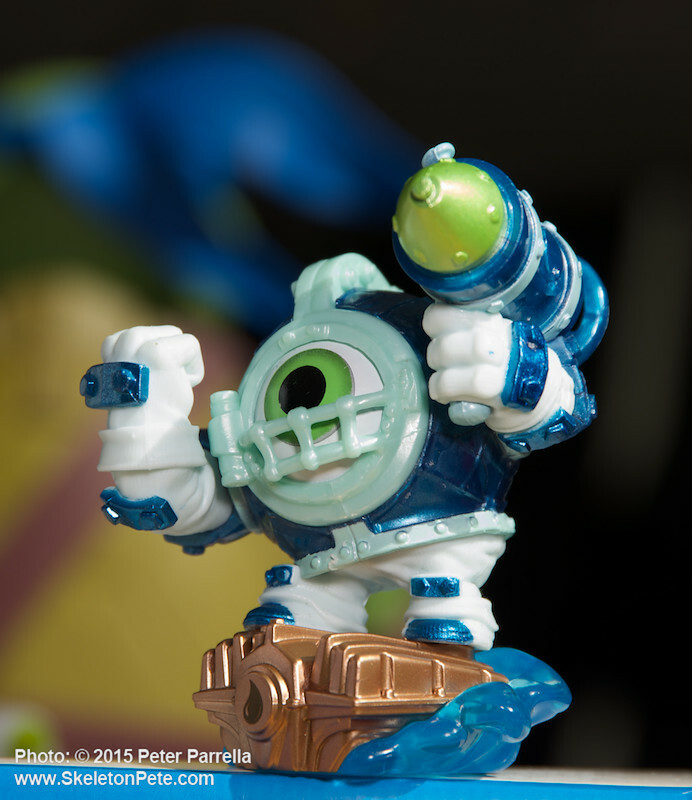 Andy and I will be giving you a closer look at some of our favorites in the coming weeks.